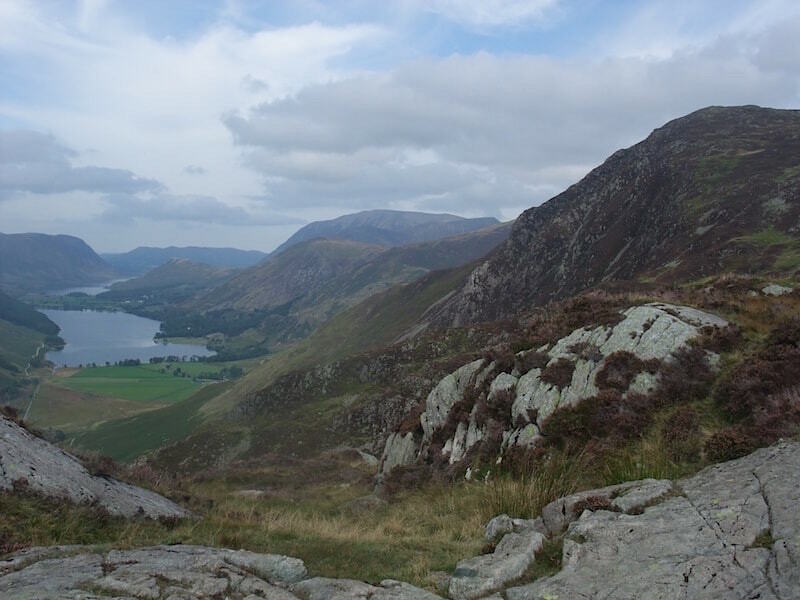 Its been a while since we had a walk up Fleetwith Pike and Haystacks and today was the perfect day to make a return visit. 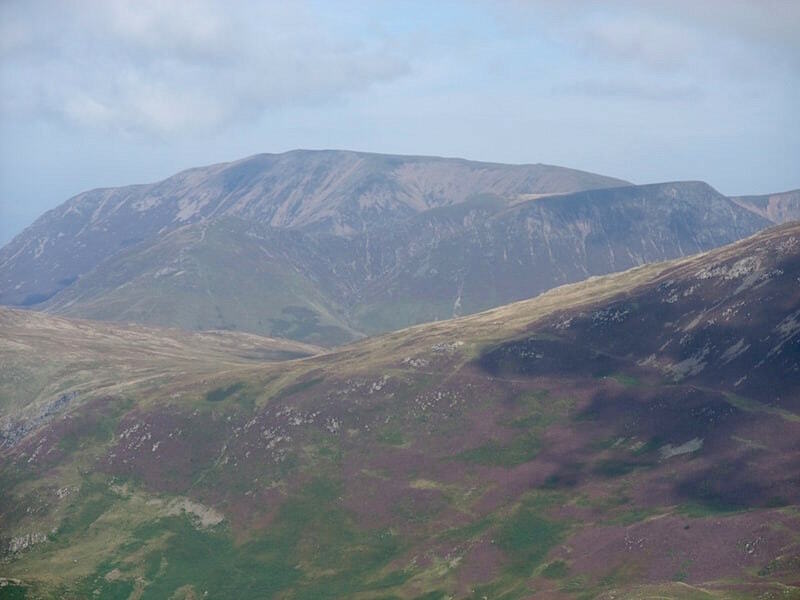 The views from the tops of both are extensive so you need clear weather to make the most of them, and that’s what was promised in the forecast. 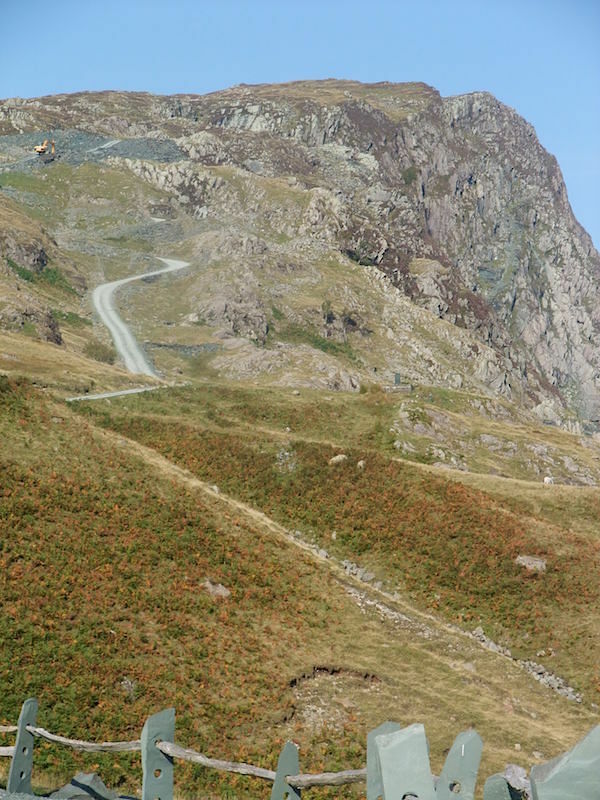 Here we’re at the Honister Slate Mine car park looking over at Honister Crag, the summit of which is called Black Star. 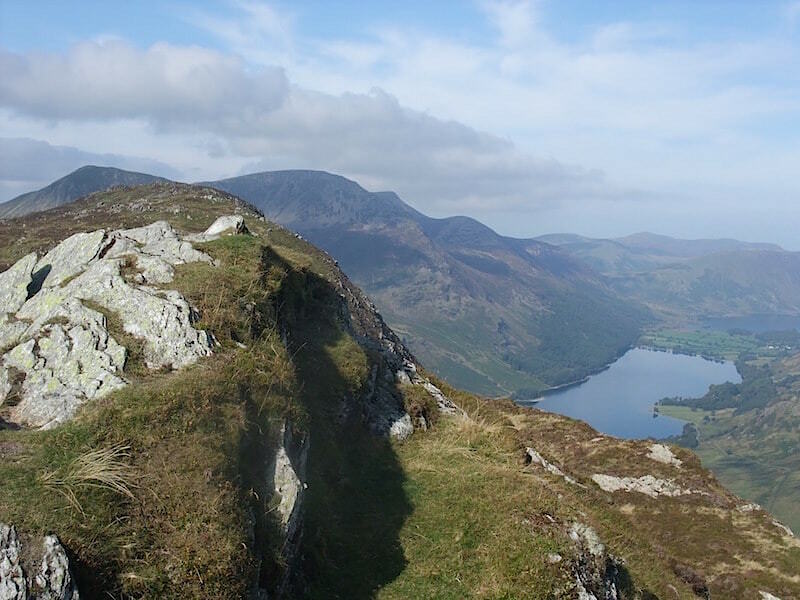 The crag forms part of Fleetwith Pike which is where we are heading first. 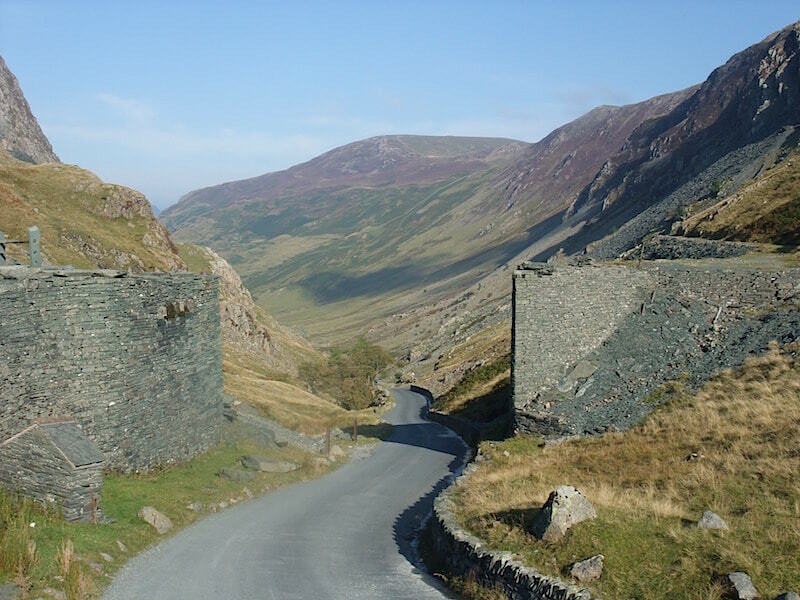 Honister Pass. The road continues on alongside Buttermere and Crummock Water and on into Cockermouth. 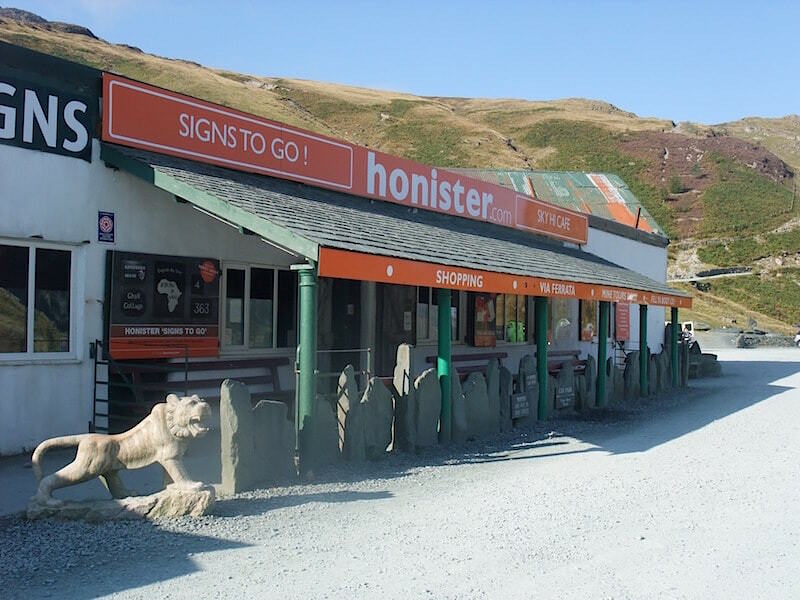 The Honister Slate Mine shop and cafe. As well as shopping and eating, you can test your nerve (or scare yourself silly) by taking part in one of the many adventure experiences that they offer, both in and around the mine. 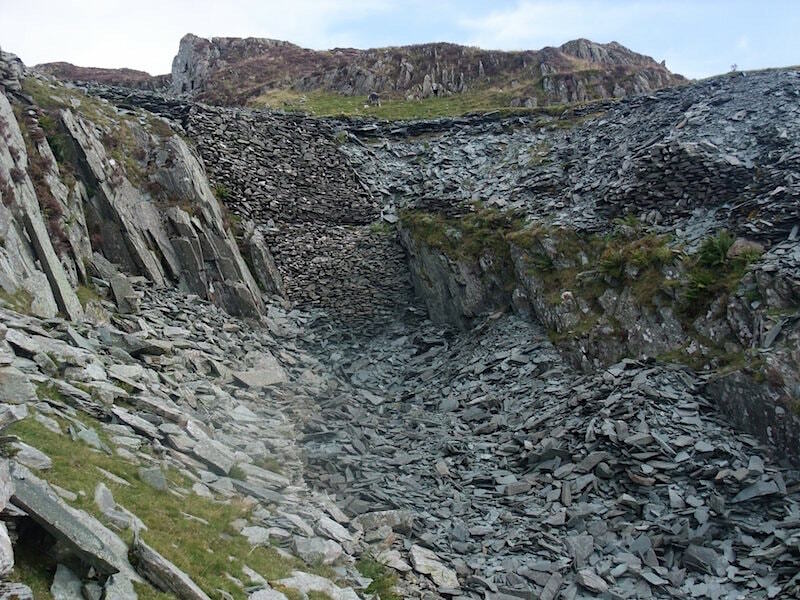 Its a working mine too, producing both industrial and domestic items in the lovely green slate that the mine provides. 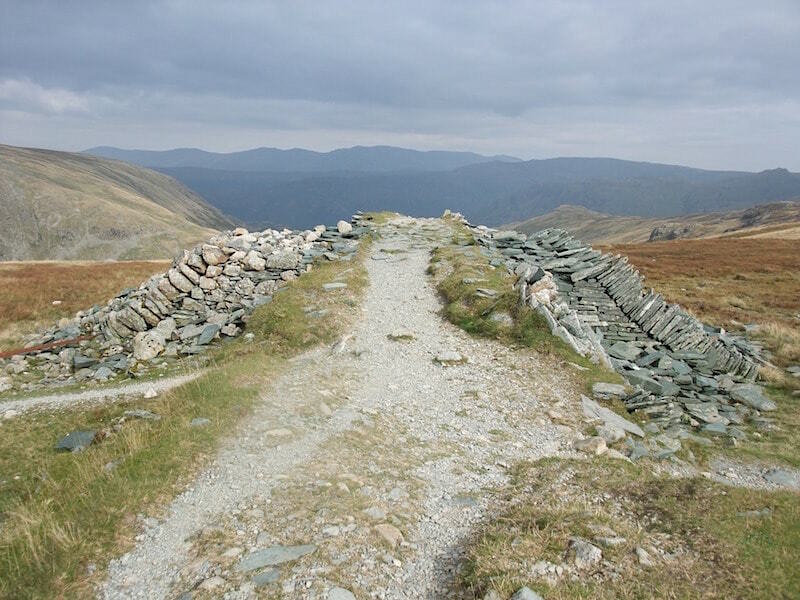 The path from the mine follows the route of an old tramway which once transported wagons carrying the quarried slate. 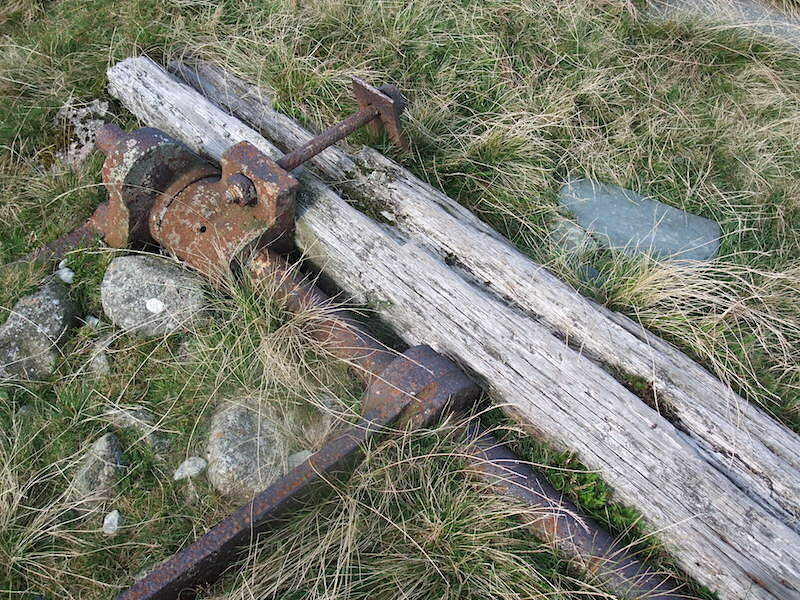 The wooden sleepers were removed when the old mine closed, although a few have been left here and there. This is all that remains of the old drum house at the top of the track which housed the winding gear for hauling the wagons up and down between the quarrying area and the workshops below. Just peeping out on the left is Pillar. 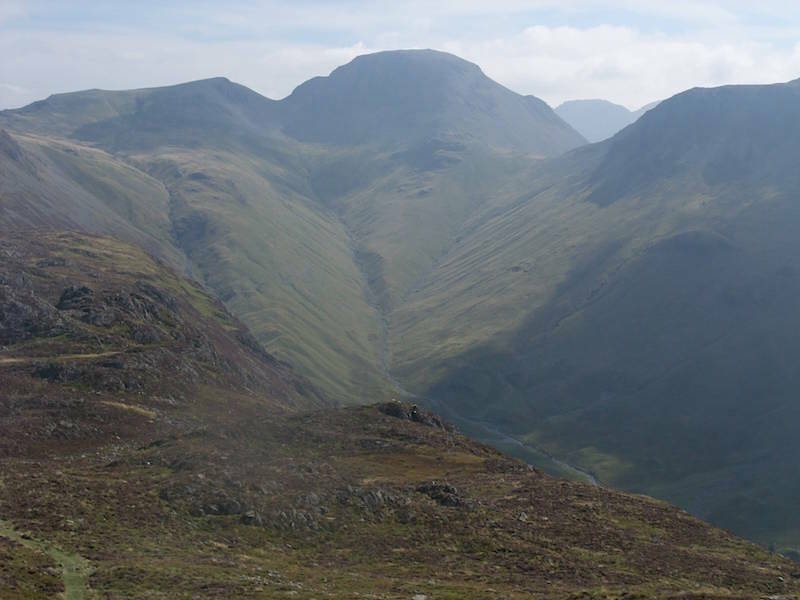 One path from the drum house passes below Grey Knotts and continues across towards Green Gable and Great Gable. A side view of the remains of the drum house. Some of the drum house equipment is still lying around. Whatever it was used for it was certainly sturdy enough. 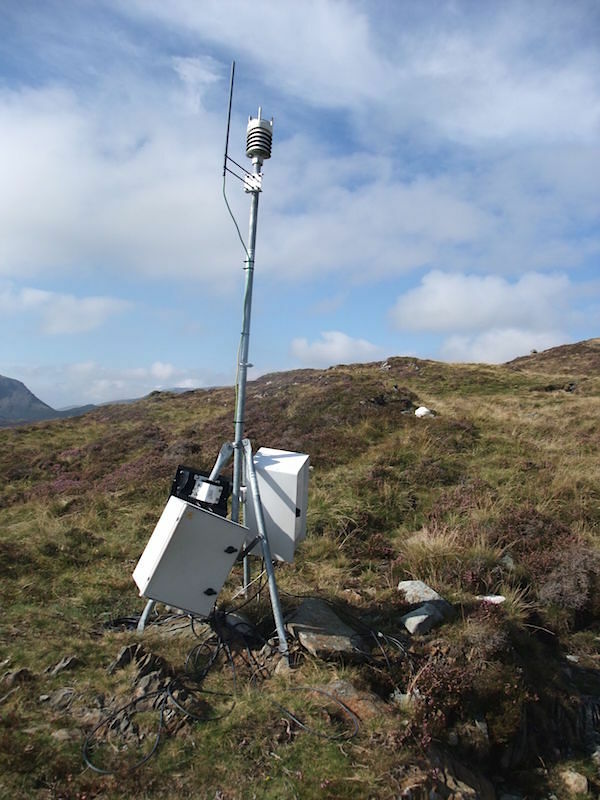 From the old to the new, a weather station on the climb to Fleetwith Pike. Making our way up to Black Star. 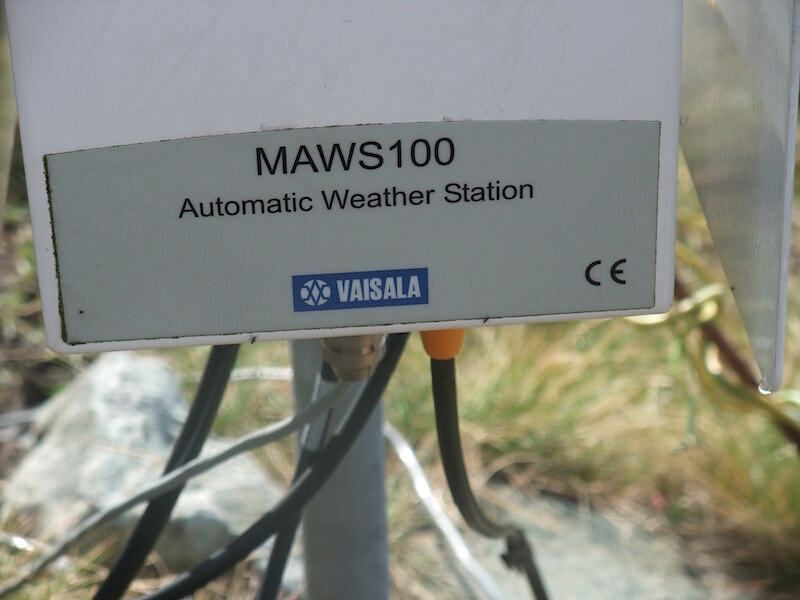 Its now getting quite hot. 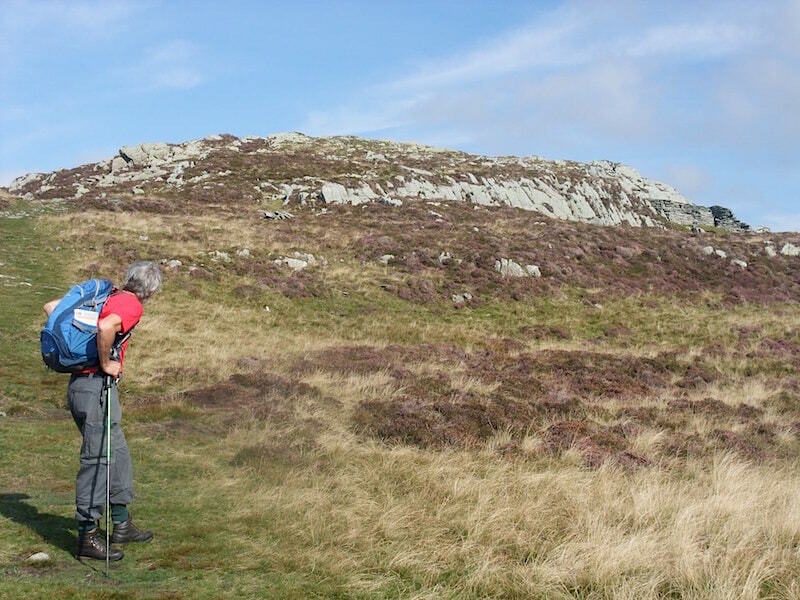 There are a few paths to choose from, but this one will do to reach the top of Black Star. 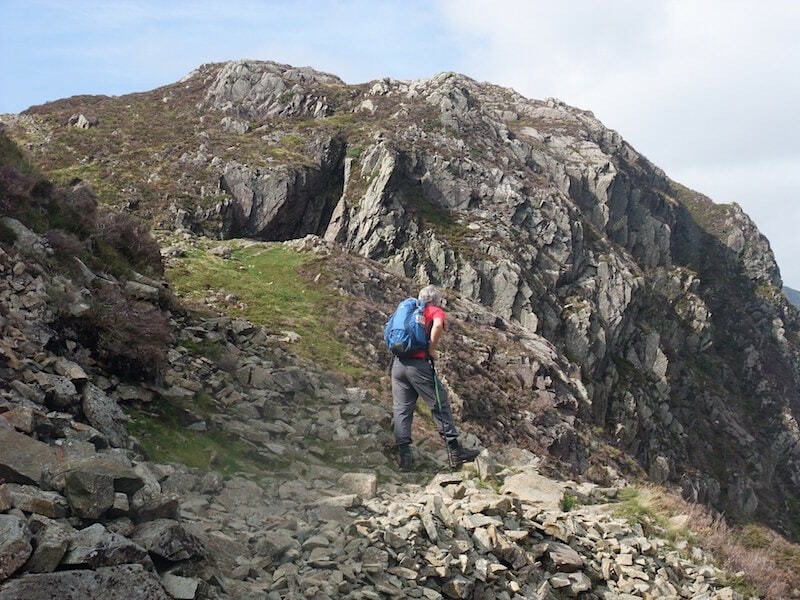 There is no feeling of height at the moment since all we have done so far is walk up the grassy slopes and then pick our way through these crags. Suddenly you reach the top, the white stones mark the summit, and there is just that ledge over on the right of the photo between you and a 1400′ vertical drop down to the Honister Pass road below, Here I’m looking down at Buttermere, looking down at the road below was just too nerve-wracking. If there had been the slightest hint of wind I would not have been standing here, believe me. 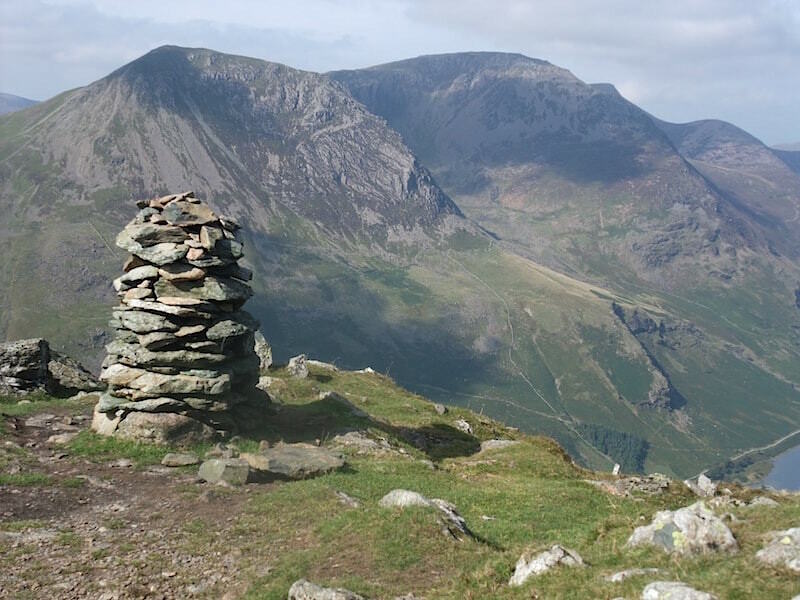 Immediately behind the white stones is the grassy summit of Fleetwith Pike just a short distance away. A couple of steps back and there is no sense of danger and no steep drops. 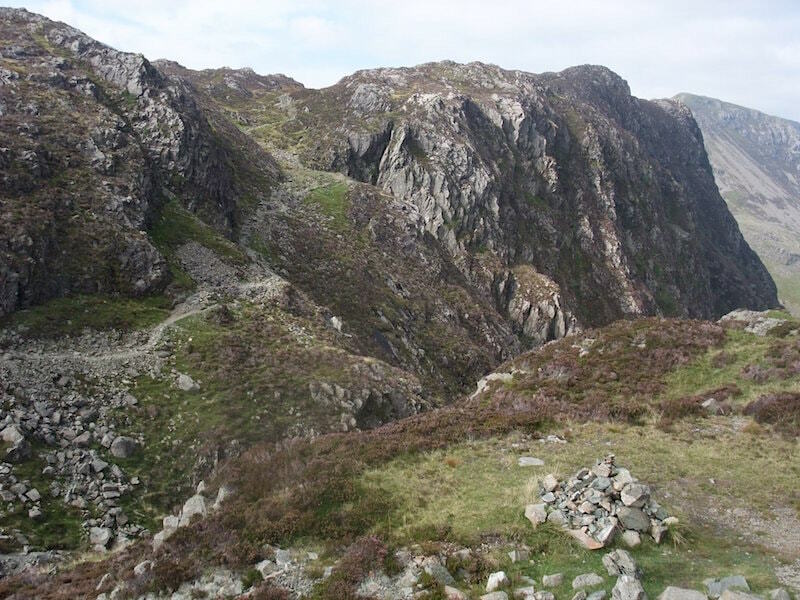 Haystacks can just be seen wedged between us and Pillar on the skyline. 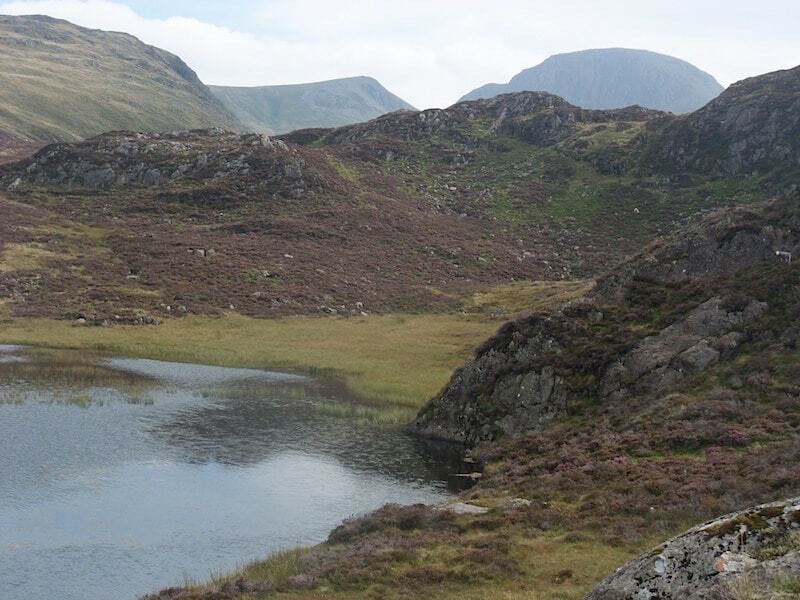 An un-named tarn on the route between Black Star and Fleetwith Pike. 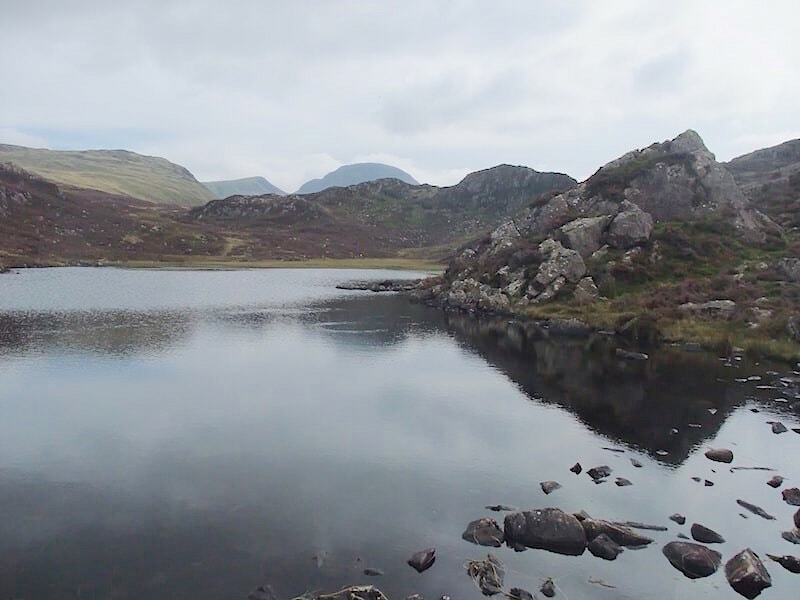 Down at the un-named tarn. 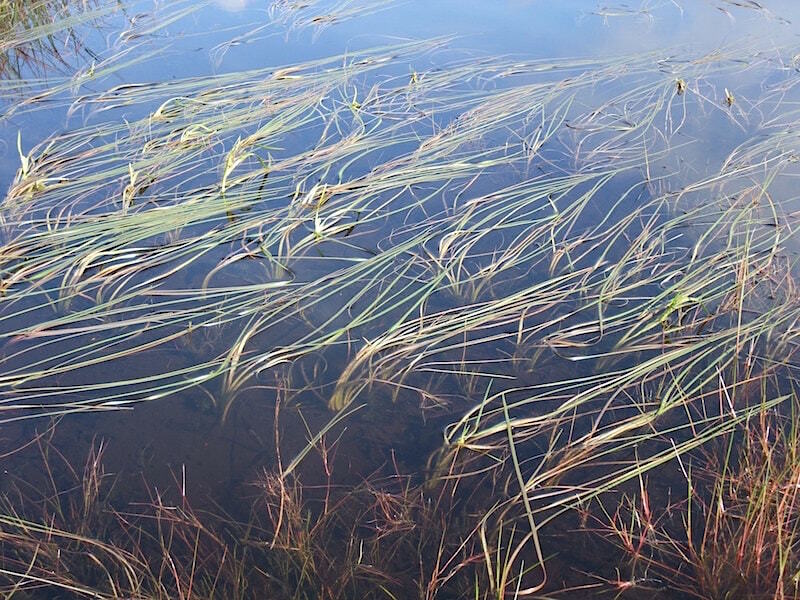 A close up of the grasses floating across the tarn’s surface. There must be a reason why they prefer growing in this direction but I couldn’t work out what it is. Its in a hollow sheltered from winds, and the prevailing winds come from the opposite direction anyway. Its a static pool so there is no flow movement to account for it. That just leaves the sun, the moon or the fairies, having something to do with it. 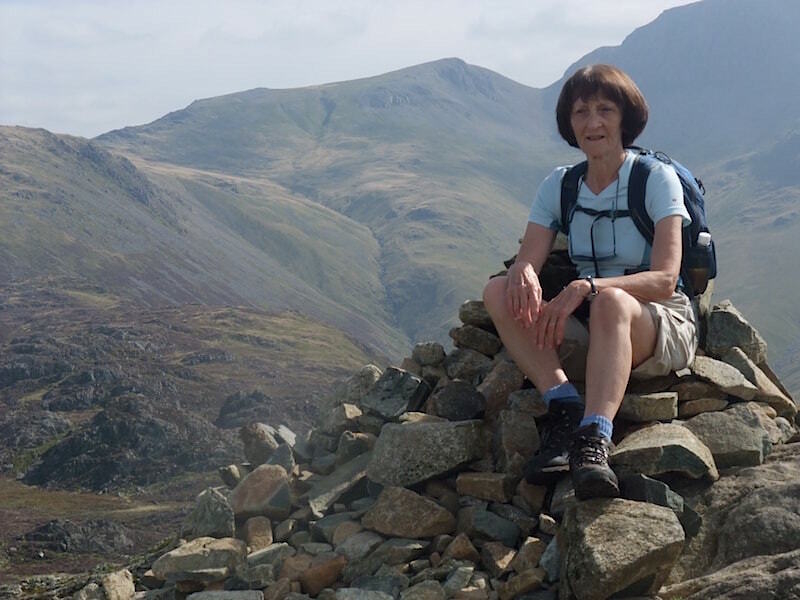 Here we are on the summit of Fleetwith Pike with a wonderful view of Buttermere, Crummock Water and the surrounding fells. 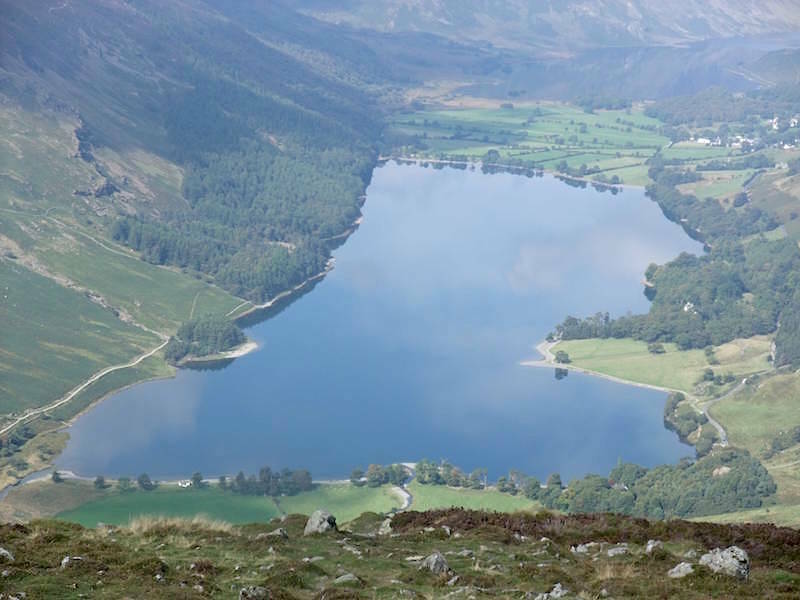 Its a little difficult to identify Crummock Water but its just behind that broad green strip of land in the middle. 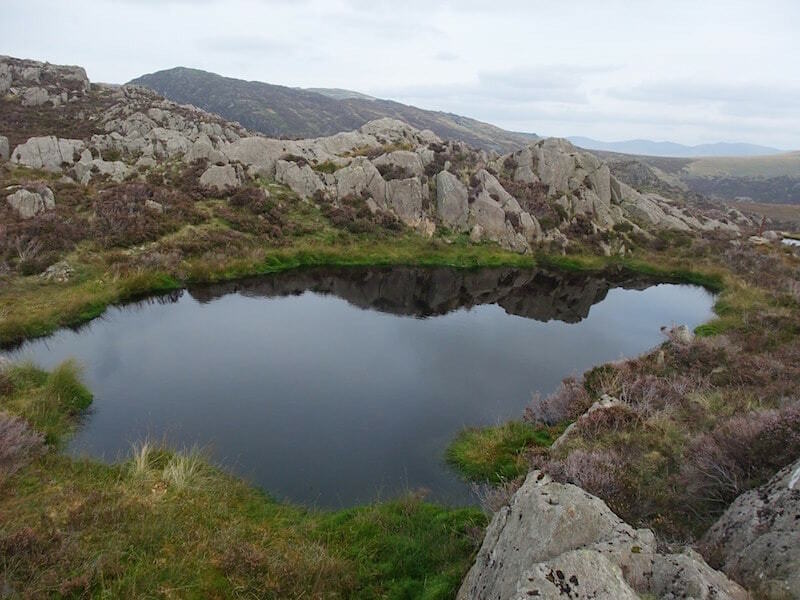 Mellbreak, the fell in the middle of the shot is reflected in it. 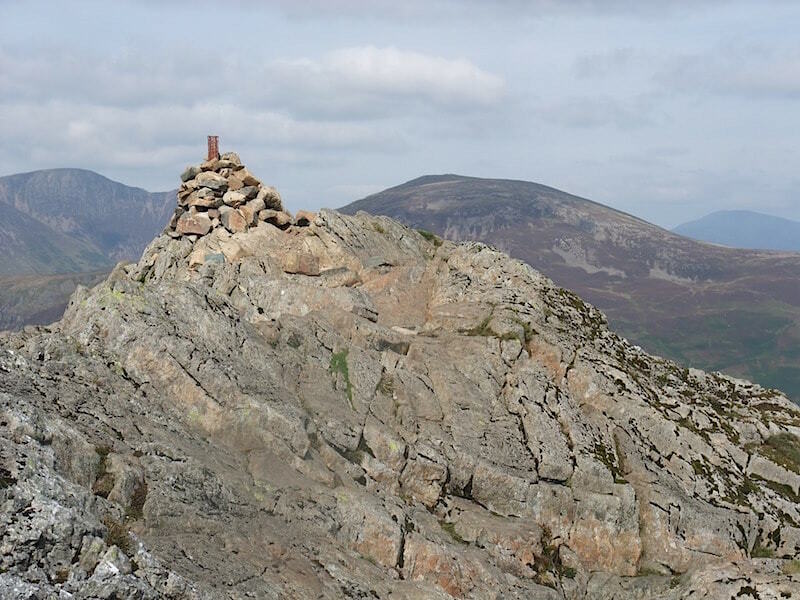 A neat and tidy cairn on Fleetwith Pike with High Crag, High Stile and Red Pike behind. 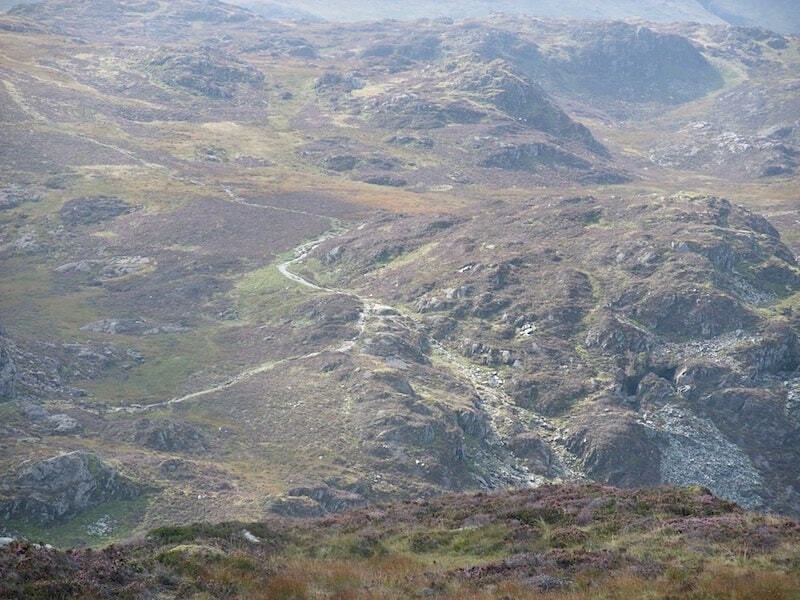 This really is a jaw-dropping viewpoint, fells in all directions and as far as the eye can see. 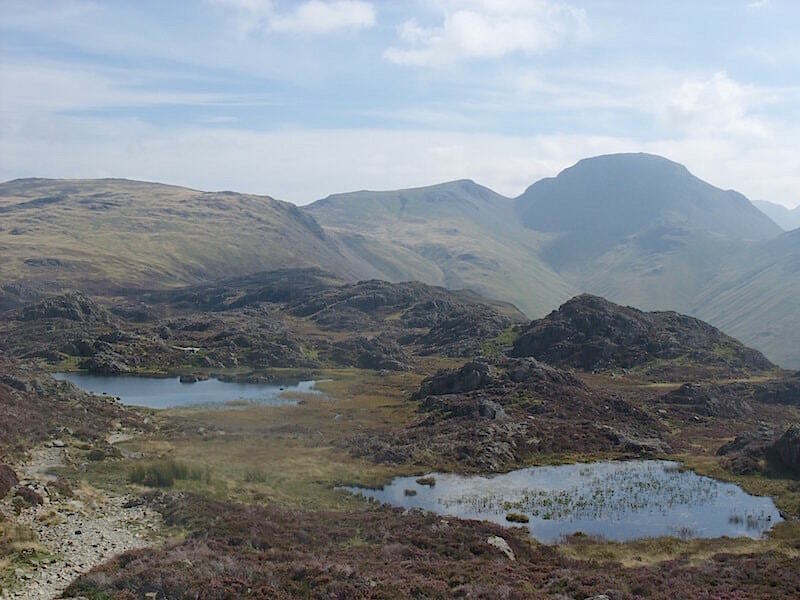 Poor little Haystacks, in the foreground, constantly dwarfed by its macho neighbour Pillar. 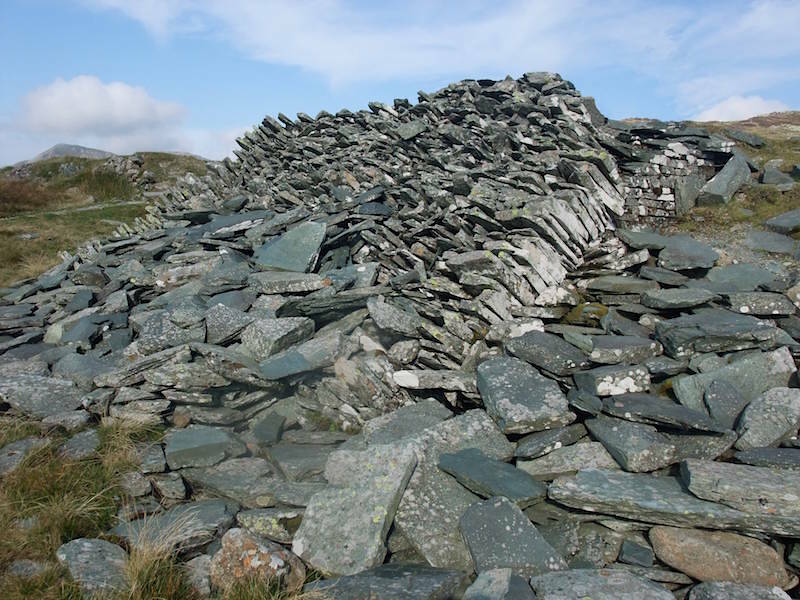 The other cairn on Fleetwith Pike, an untidy mound of rubble which is nowhere near as elegant as the other one close beside it. 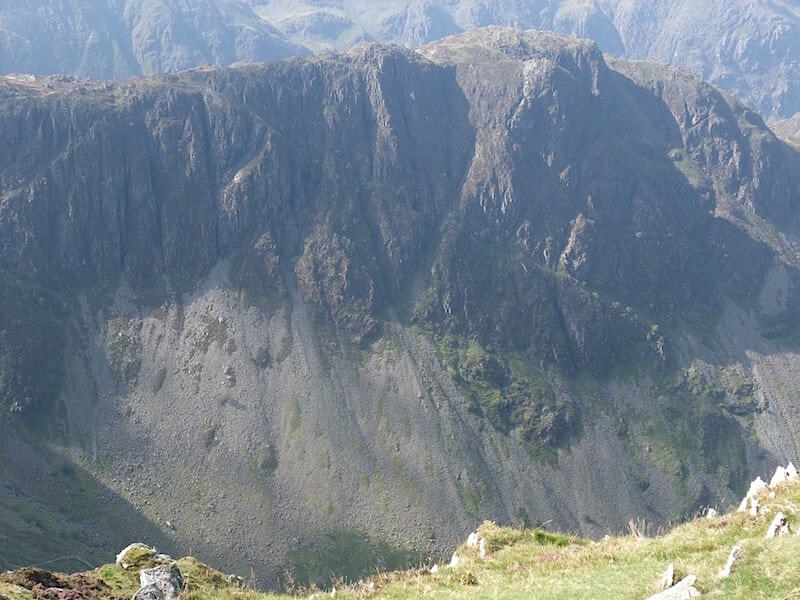 Haystacks in close up from Fleetwith Pike. 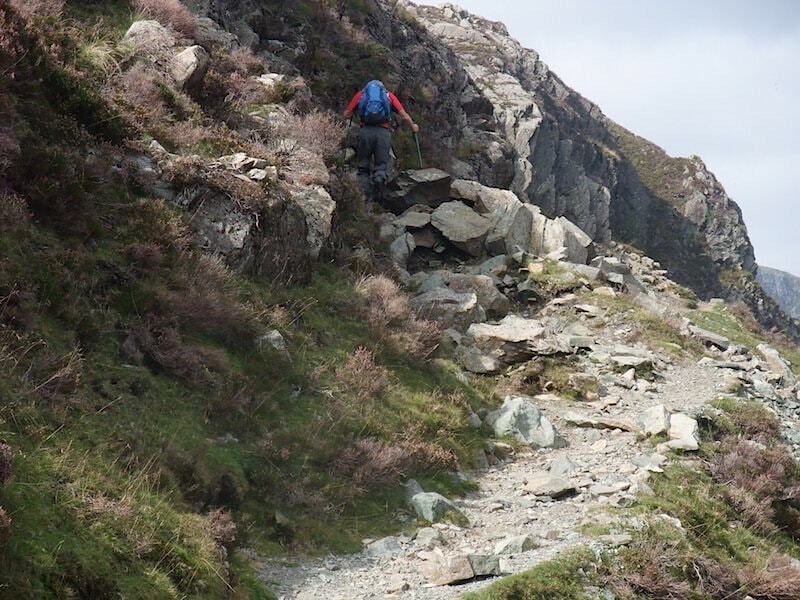 If you recall the vertical drop I mentioned when we were on Black Star/Honister Crag this is the sort of situation I was trying to describe. 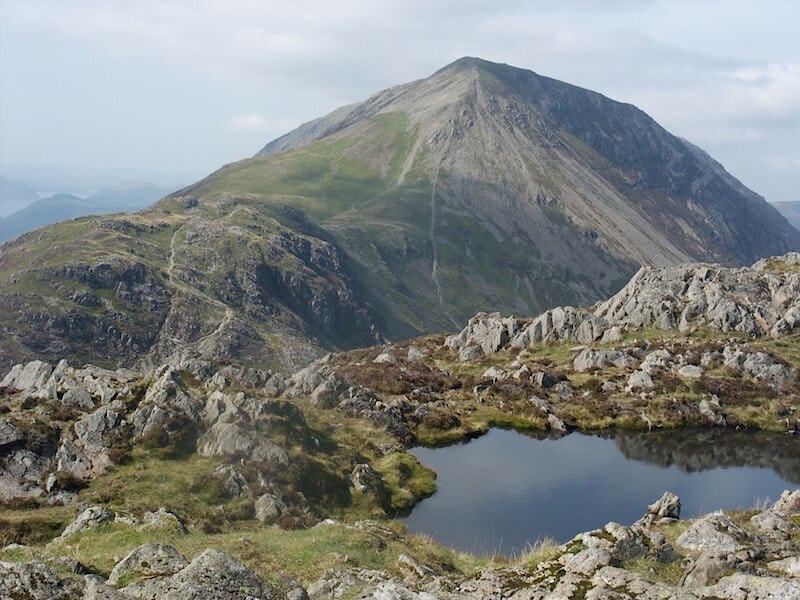 Honister Crag is similar in appearance to this side of Haystacks so you may be able to imagine why I was reluctant to look down when I was on the summit. 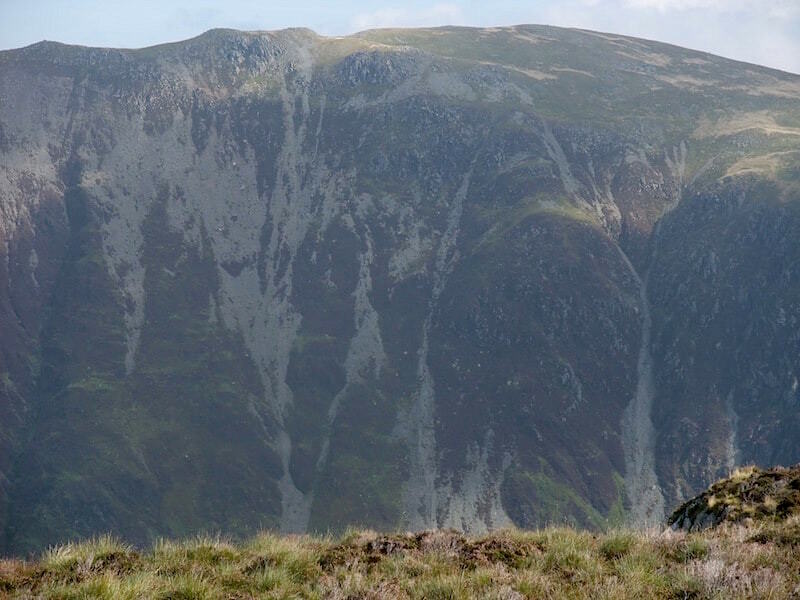 Dale Head from Fleetwith Pike. The Honister valley between this side and that is a U-shaped valley and has been carved out of volcanic rock by glacial action. The Gatescarthdale Beck flows along the bottom of the valley into Buttermere. 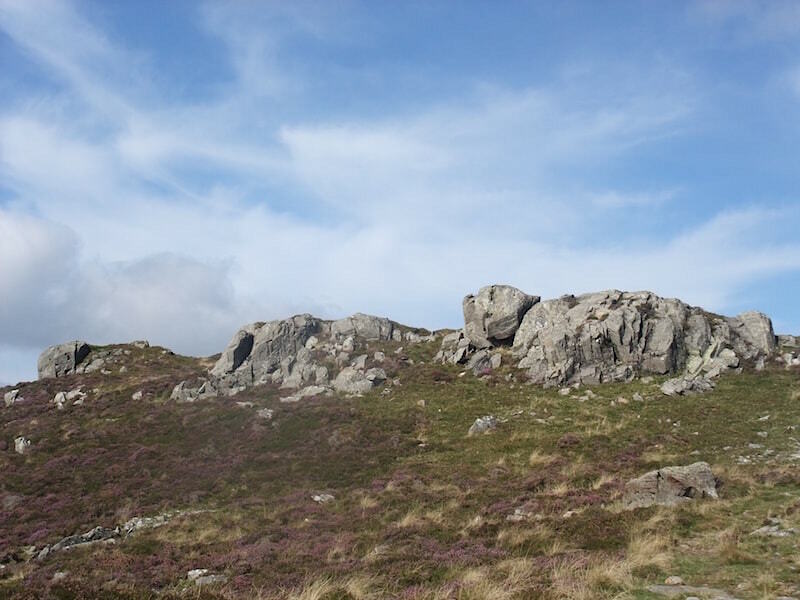 Also on the opposite side of the valley is Hindscarth. 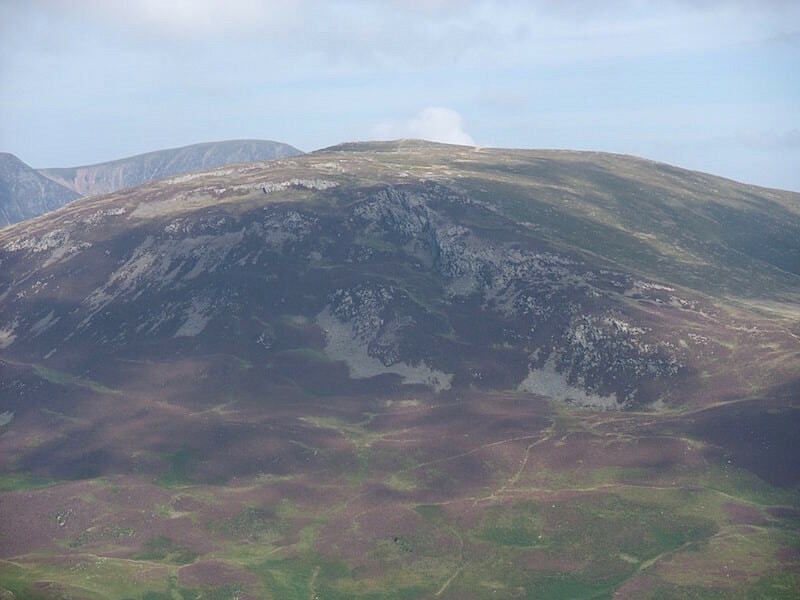 The next fell along from Hindscarth is Robinson with Crag Hill just behind it. 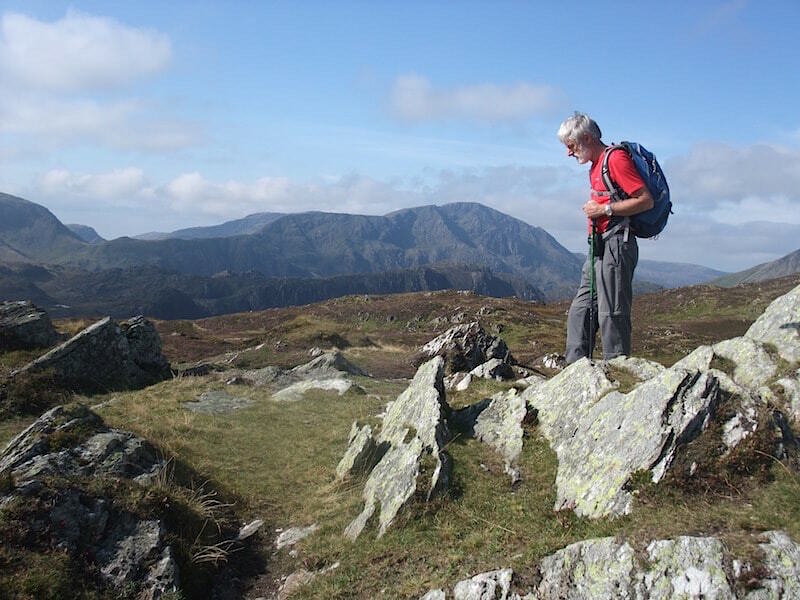 Still on Fleetwith Pike and now looking across the lower slopes of Robinson to Grasmoor on the skyline. 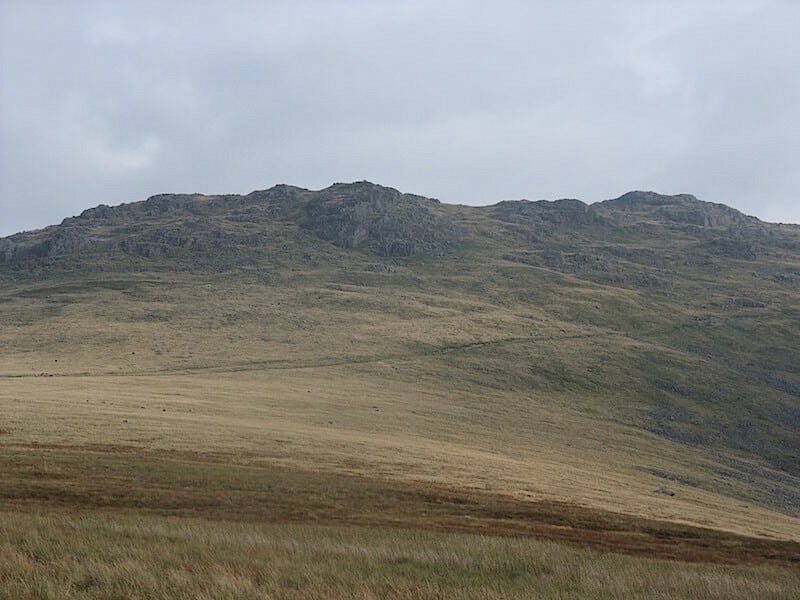 In front of it you can just make out Whiteless Pike with Wandope on the right. 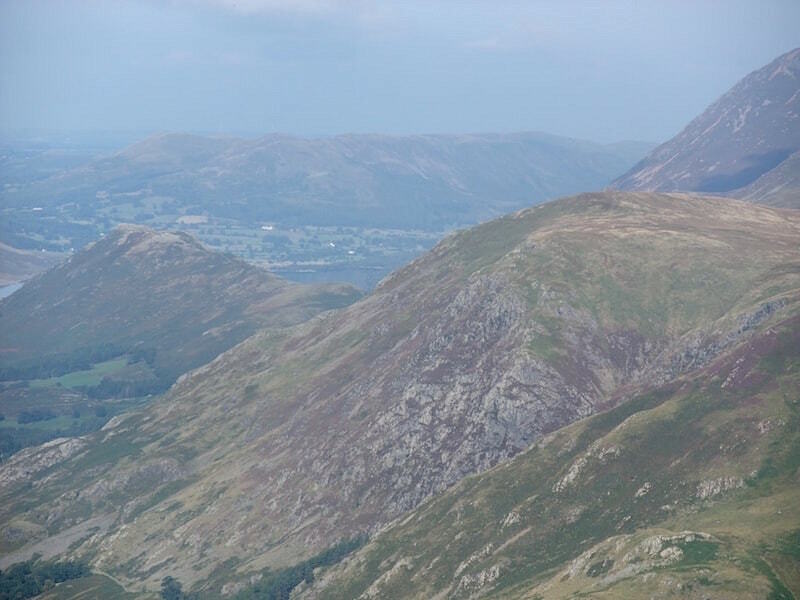 Again from Fleetwith Pike, a view of High Snockrigg on the right and Rannerdale Knotts to the left. 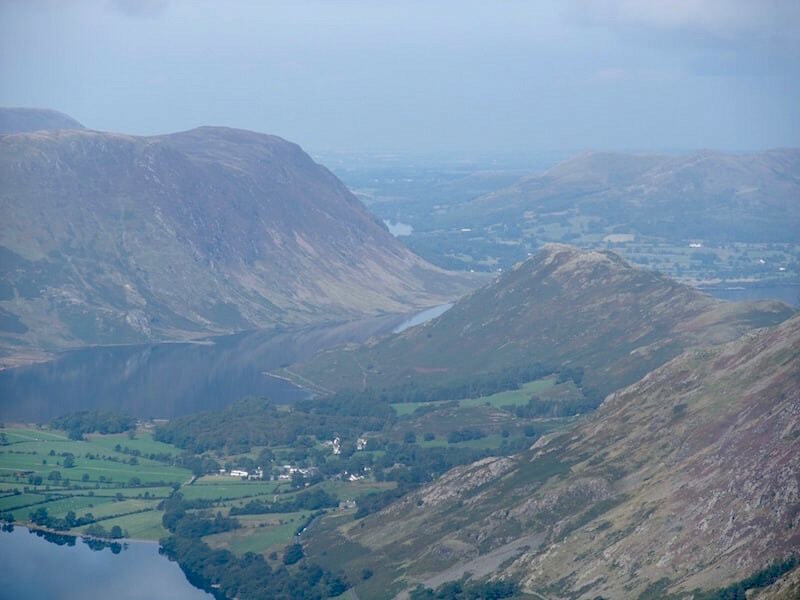 Crummock Water sandwiched between Mellbreak and Rannerdale Knotts, with Loweswater just peeping out in the centre. 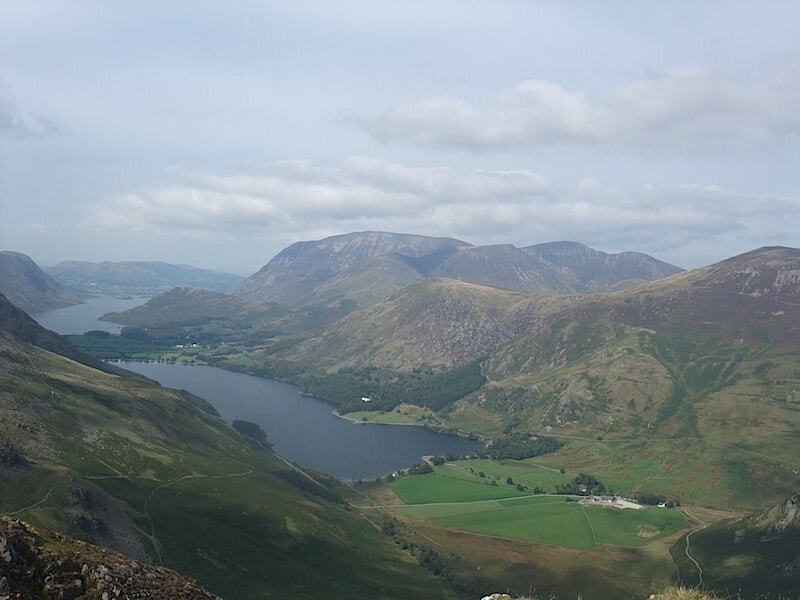 Fleetwith Pike offers a great view of Buttermere. Well, we’ve had a good look at the views and given the legs a rest so now its time to move on. 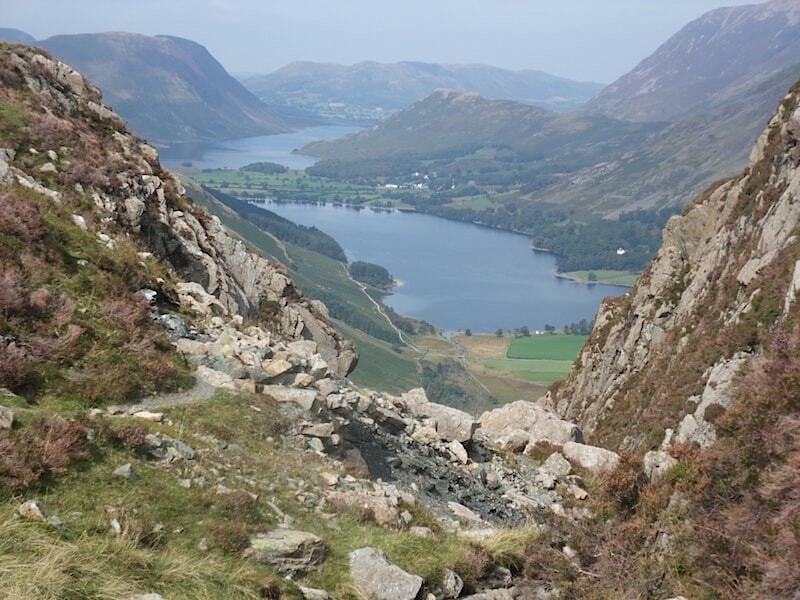 From Fleetwith Pike here’s looking at the path we will eventually take to Haystacks. 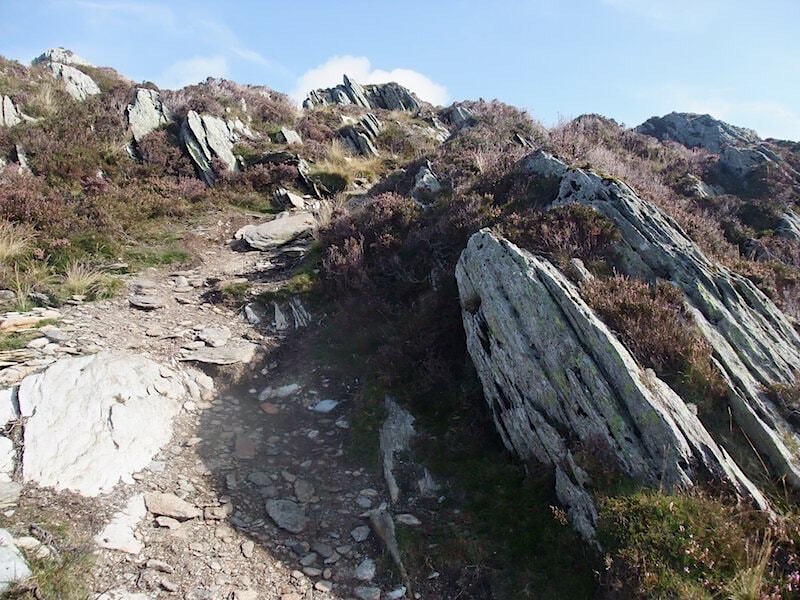 There’s a bit of a way to go though as we have to get down from Fleetwith first. The track down takes us through the old workings just by the quarry road, so we take a bit of time to have a look around. Every visit seems to reveal something new/different, so either we’re unobservant, have poor memories, or it was raining. 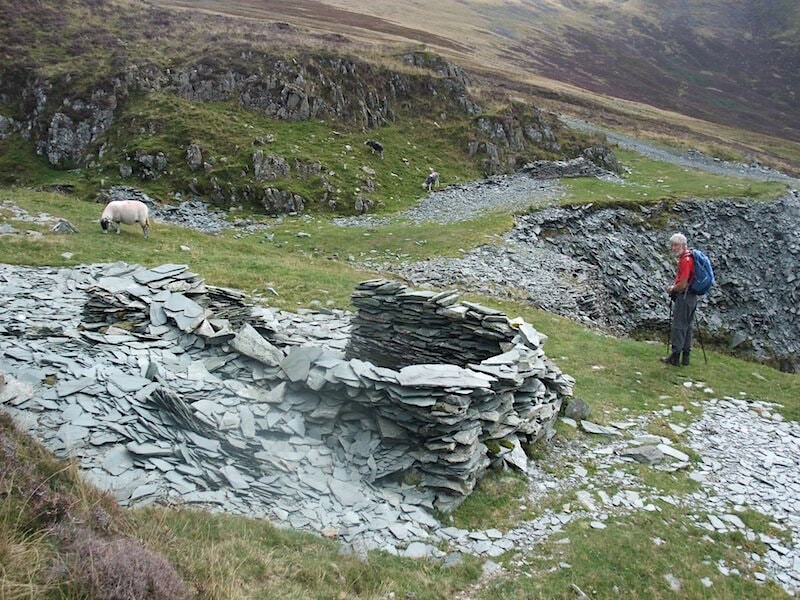 Somebody’s been busy building a shelter using the waste slate. 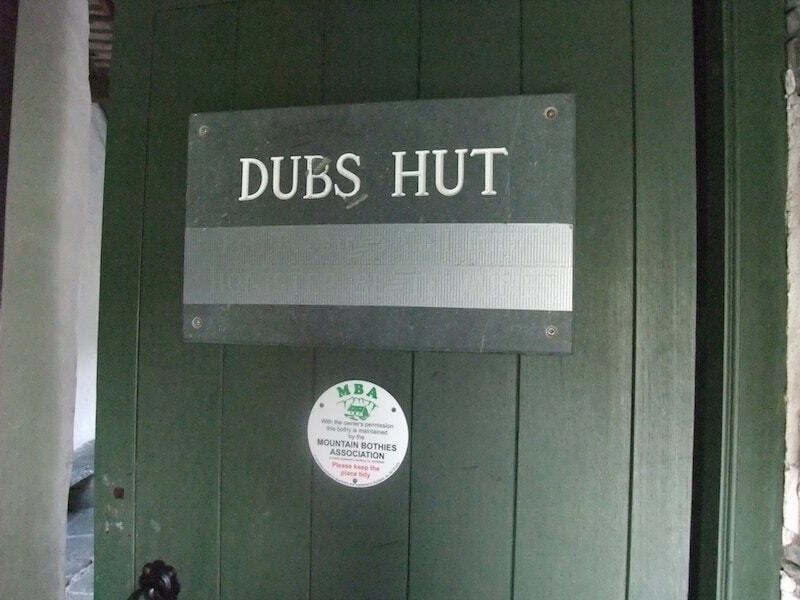 Dubs Hut exterior. 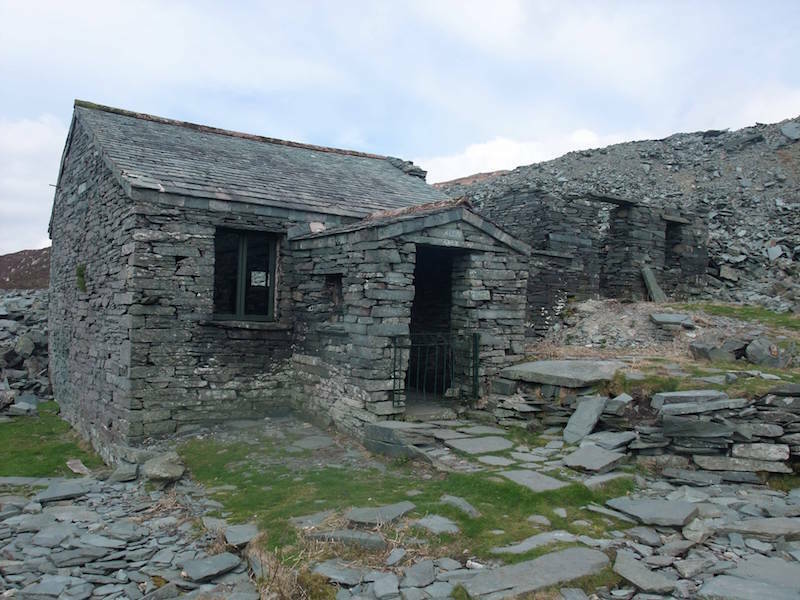 I would imagine that once upon a time it was used for storage or as a shelter by the quarrymen who worked up here. Somewhat spartan inside Dubs Hut, but its not meant to be a holiday home, its just a basic shelter known as a bothy. 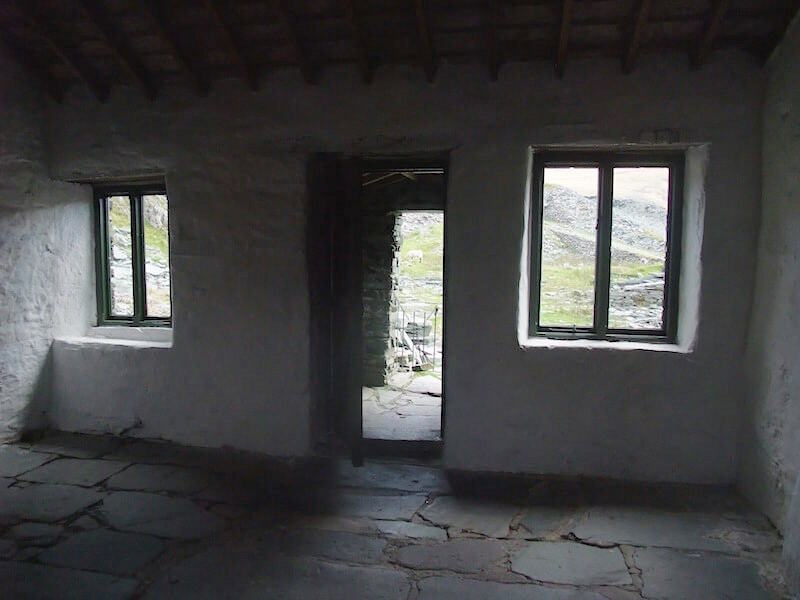 Bothies are left unlocked and anyone can use them, either for a brief respite in bad weather or for an overnight stay. You will always find a visitor’s book in one, but not much else. Anything you might need you will have to have with you, its a bit like camping but without the tent. 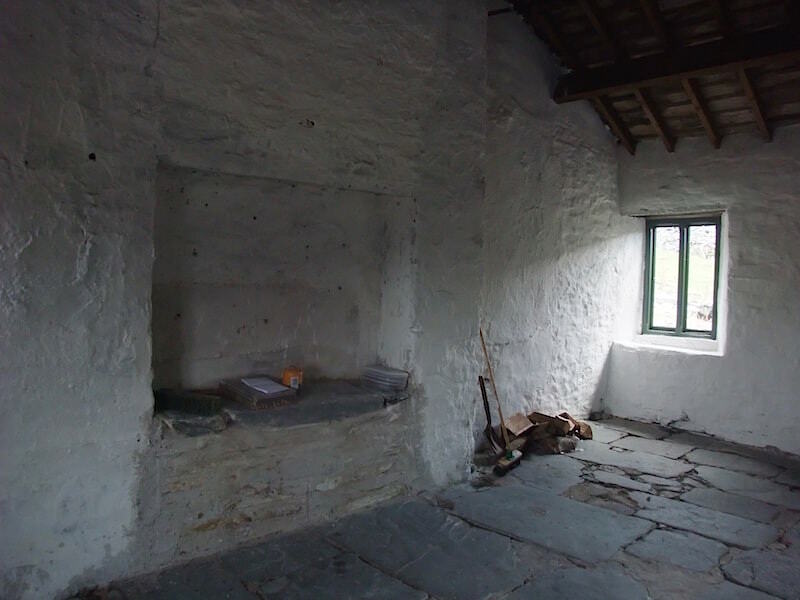 No running water, no sinks, toilets, baths or showers, no central heating although there might be a fireplace and there might even be some wood, firelighters, matches and candles. Always assuming that the last people to use it didn’t deplete the stores. Logs for a fire but no fireplace. Even so, you’d be thankful to be inside it in a howling gale or a snow blizzard. 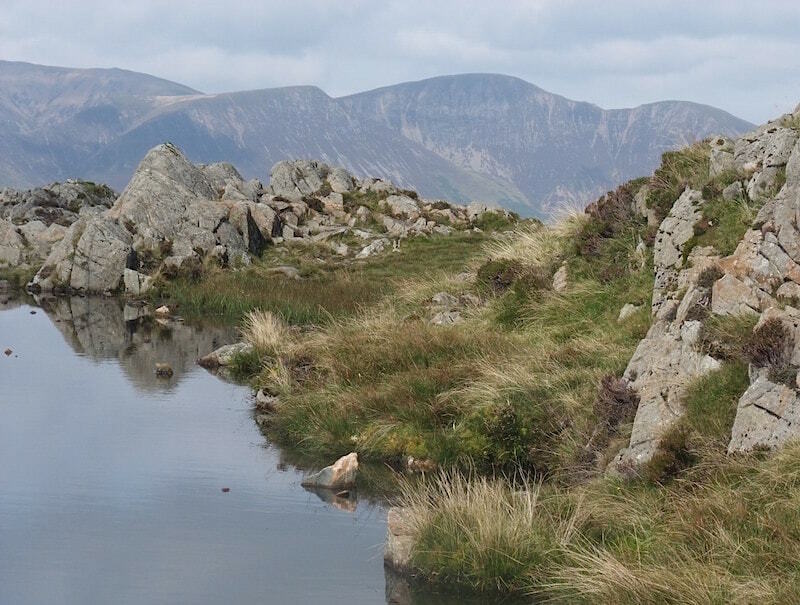 We’re just about to cross Warnscale beck to join the path to Haystacks. A glimpse of Buttermere as we move along the path. 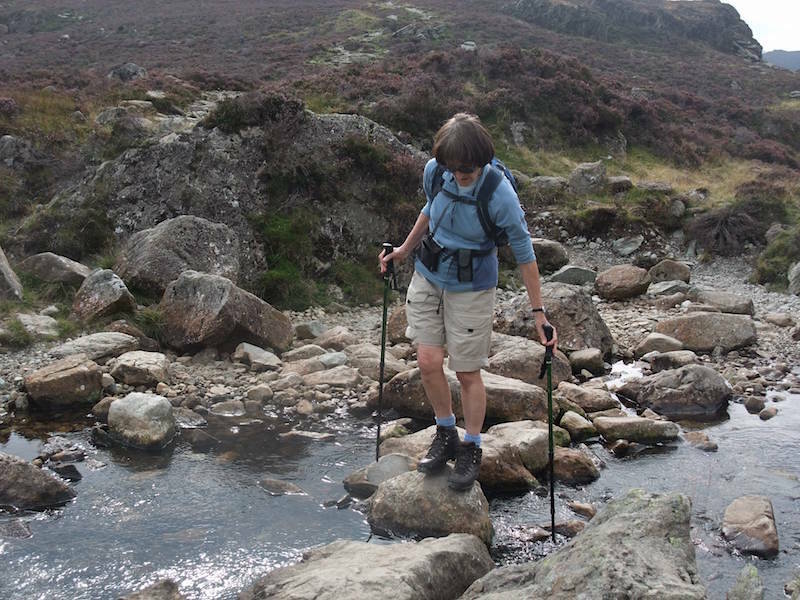 The path continues across the outflow from Blackbeck Tarn. 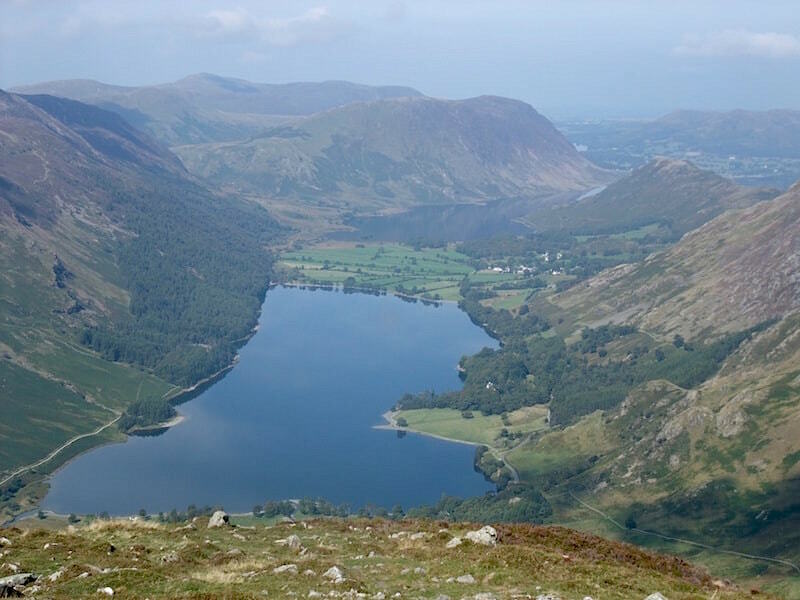 Blackbeck Tarn outflow provides a good view along Buttermere and Crummock Water. The path gets a little rougher along here but it is still easy to follow. 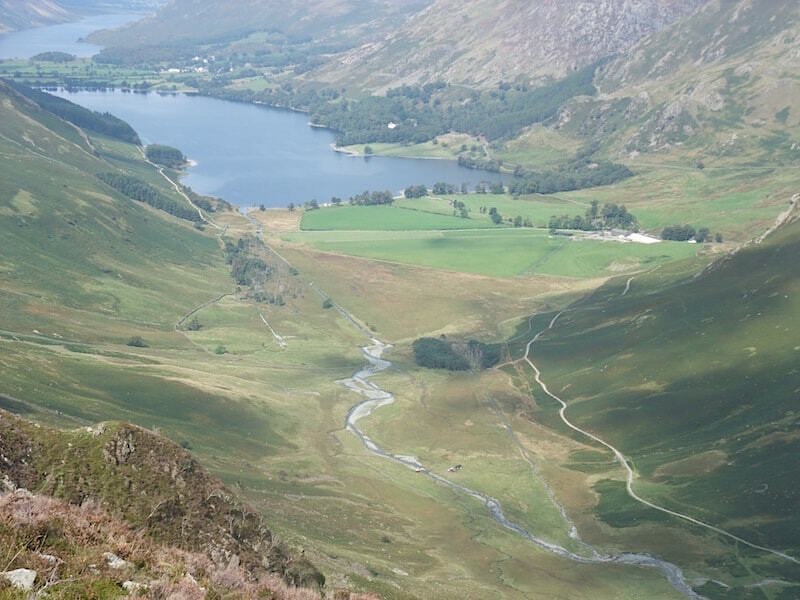 Looking across Warnscale Bottom down to Gatesgarth Farm at the head of Buttermere. Almost at the end of the rougher part of the path. 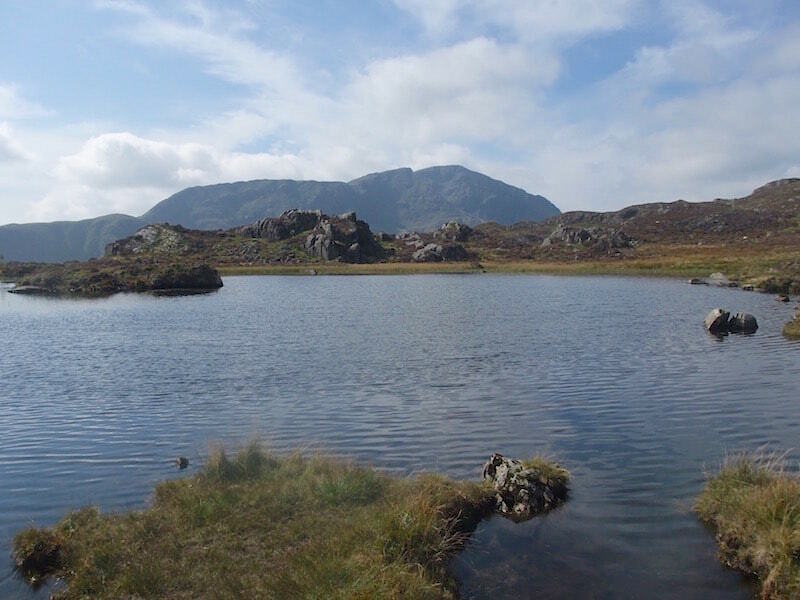 We take a break at Innominate Tarn, AW’s favourite tarn and, at his request, where his ashes were scattered. 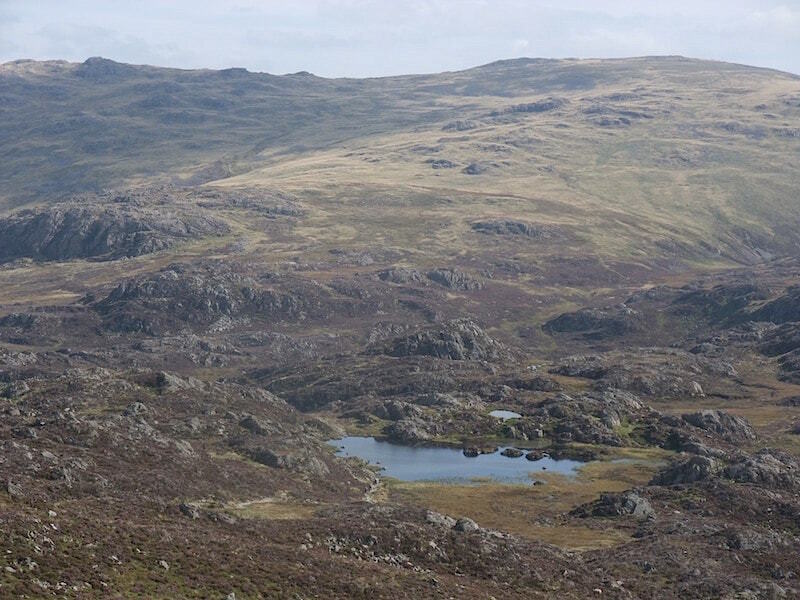 The path continues around Innominate Tarn. A view of Pillar is always available up here. 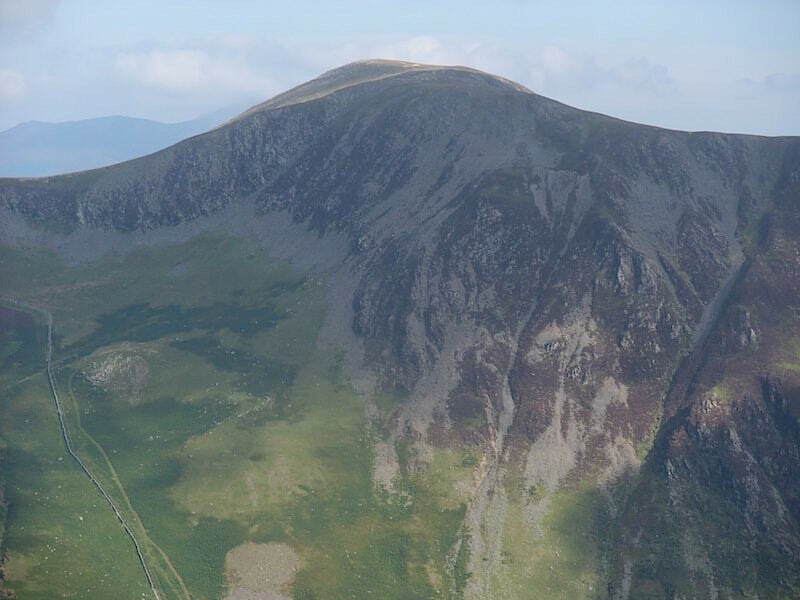 Although if you fancy a change you can always look at Brandreth, Green Gable and Great Gable instead. 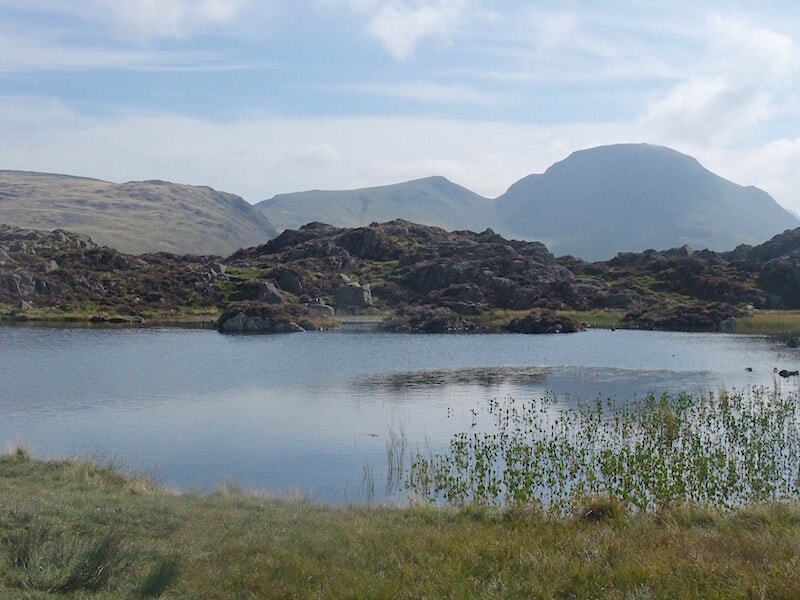 Innominate Tarn on the left, a smaller un-named tarn behind it and another un-named tarn on the right, does that make three innominates then? 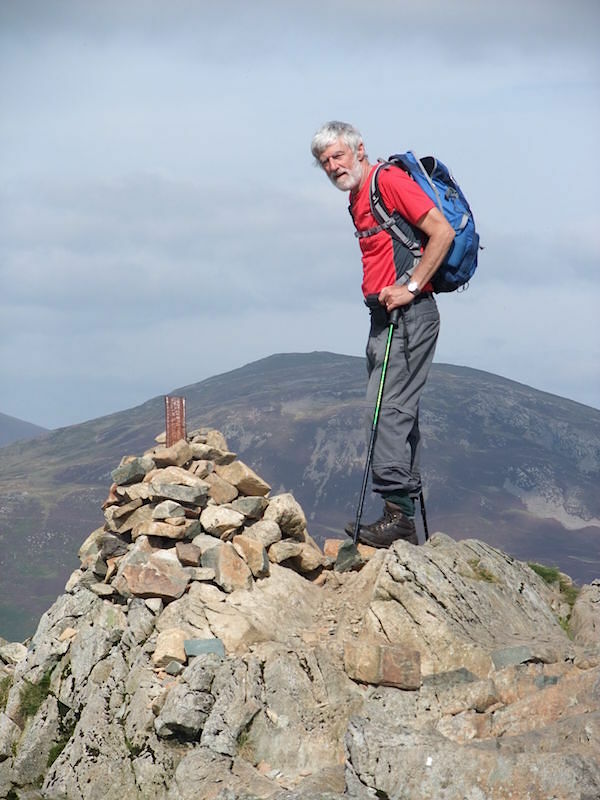 The first cairn on Haystacks. 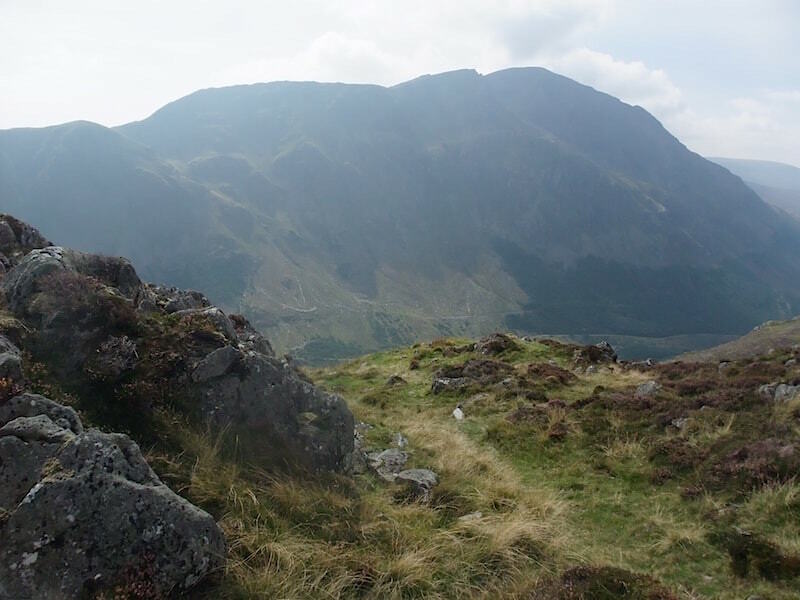 Green Gable beyond the first cairn on Haystacks. 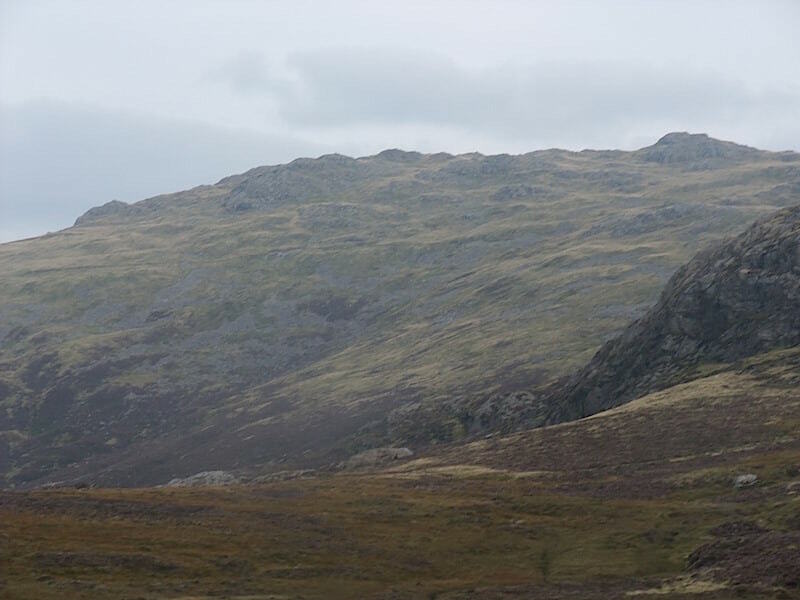 High Crag, the pointed one, and Seat, the little craggy one in front and left of it, from Haystacks. 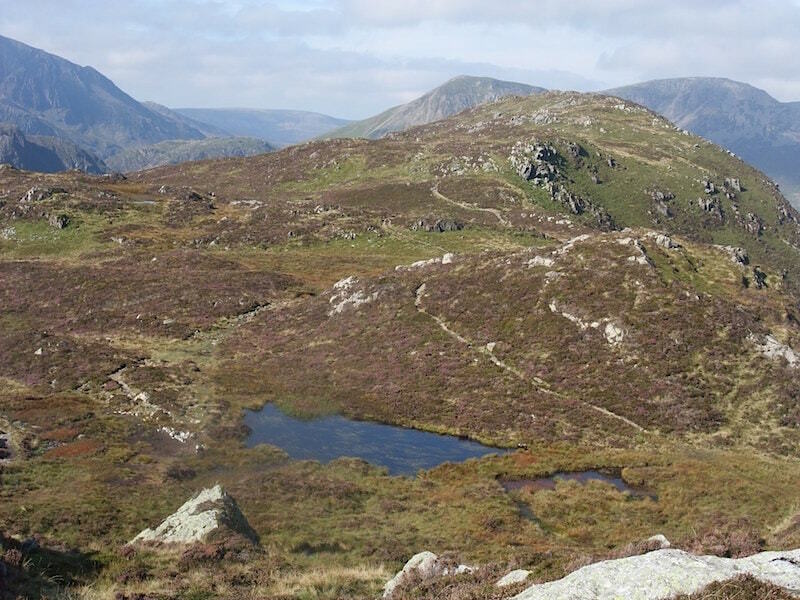 Looking back to Innominate Tarn from Haystacks summit. 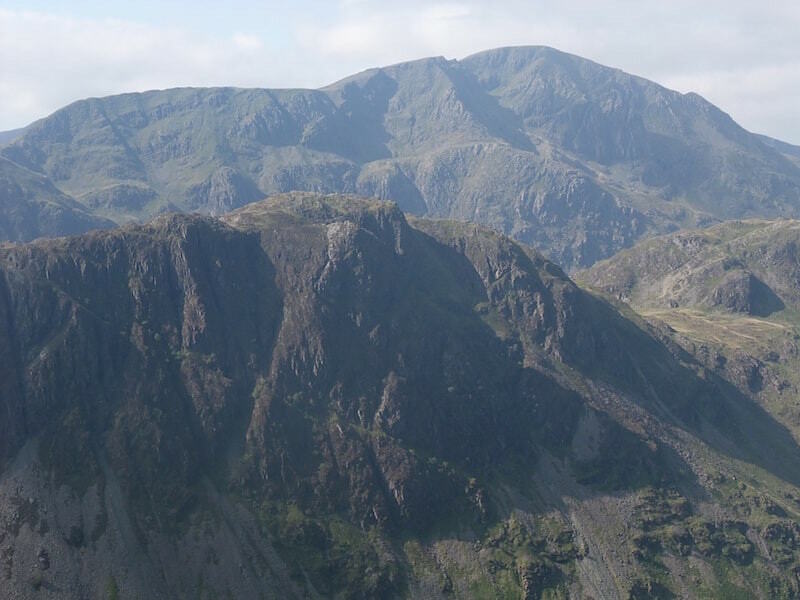 The huge bulk of Great Gable from Haystacks. 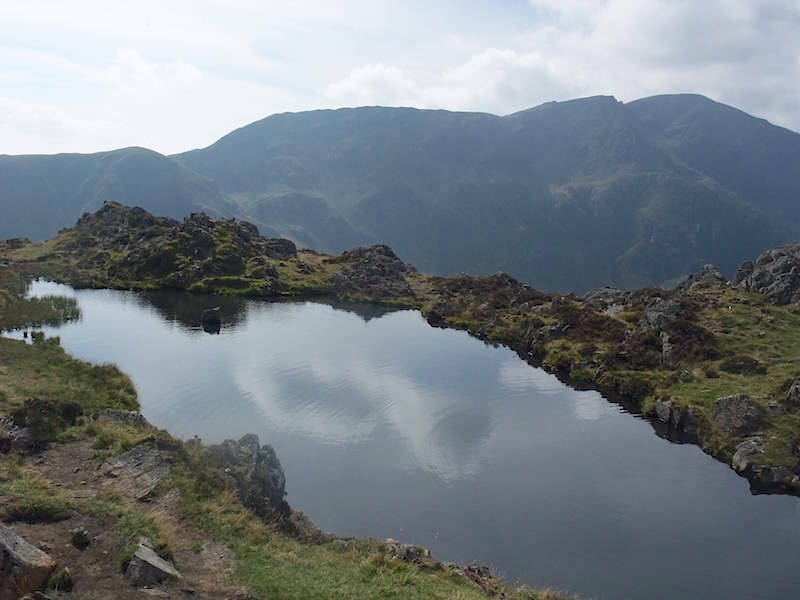 The tarn on Haystacks summit, this one doesn’t have a name either. 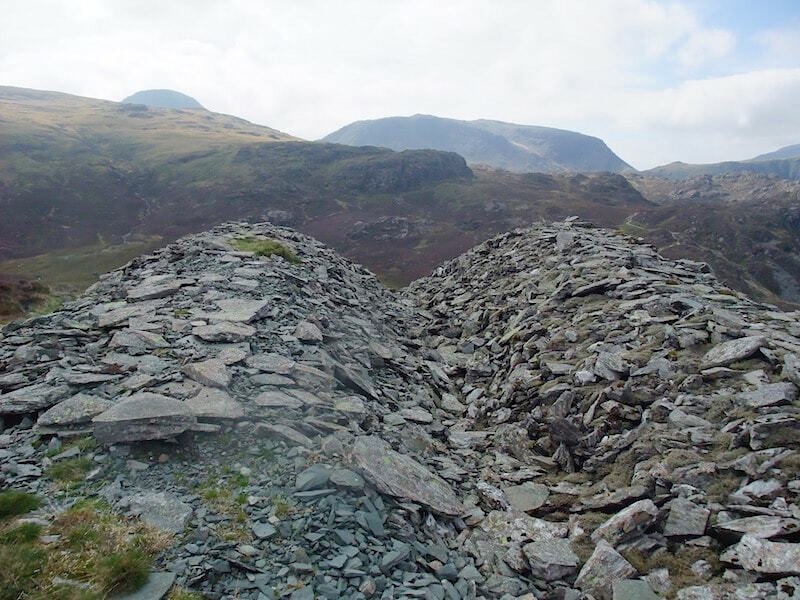 Crag Hill and Robinson behind Haystacks second cairn. 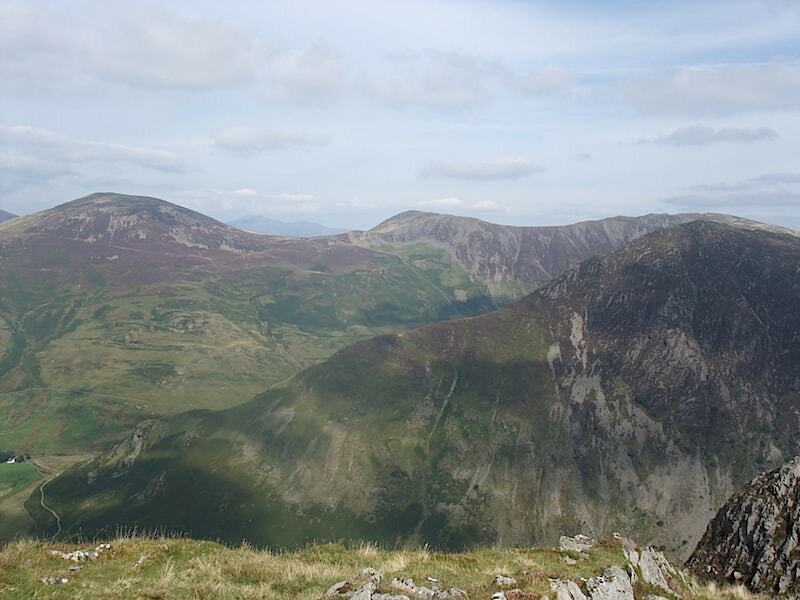 Grasmoor, Wandope, Crag Hill and Sail from Haystacks summit. 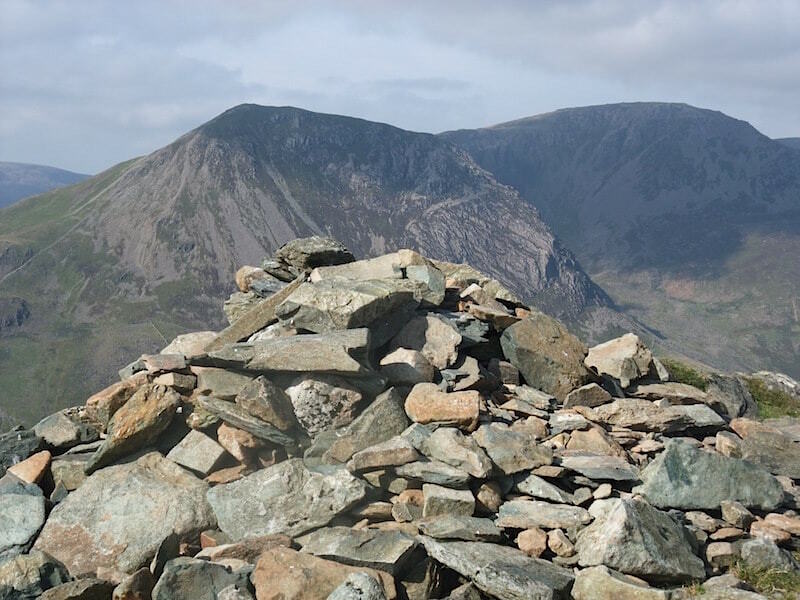 Grasmoor and its neighbouring fells from Haystacks. 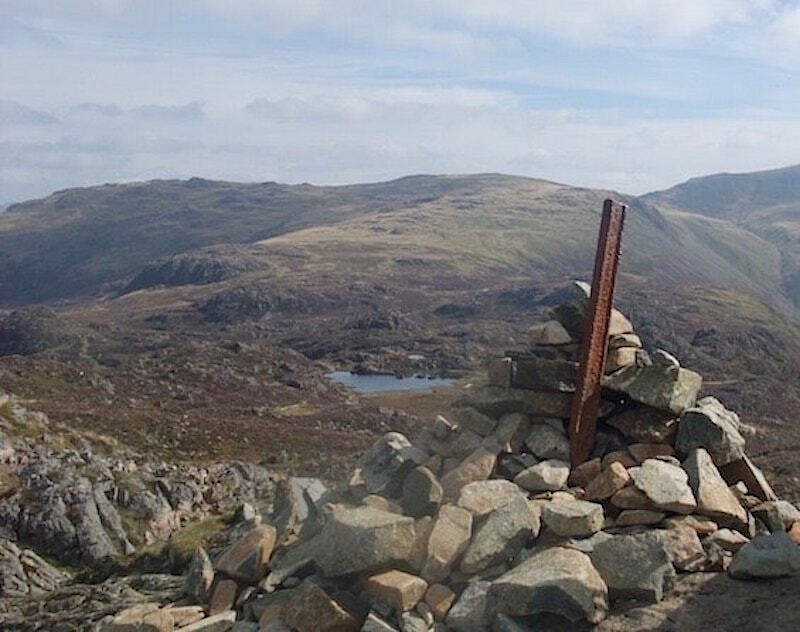 High Crag and Seat from Haystacks summit. 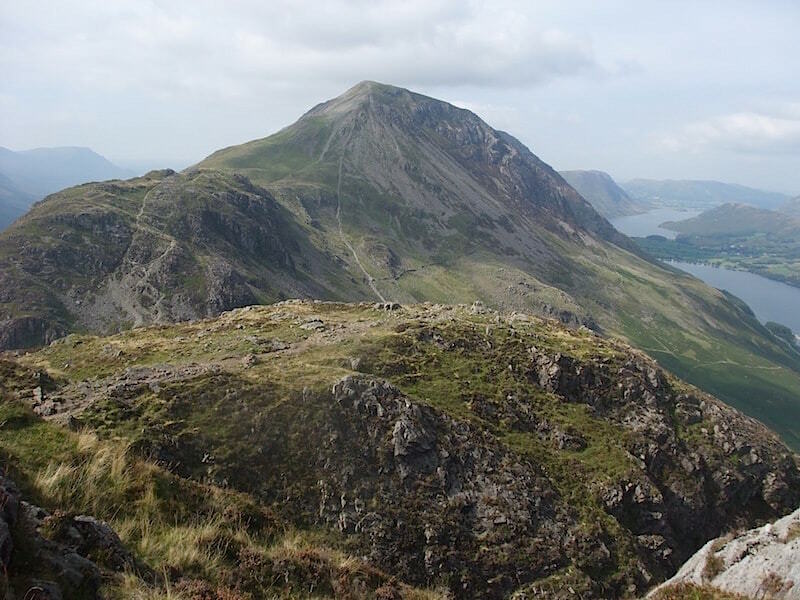 Fleetwith Pike, where we were earlier, on the right with Dale Head behind it. 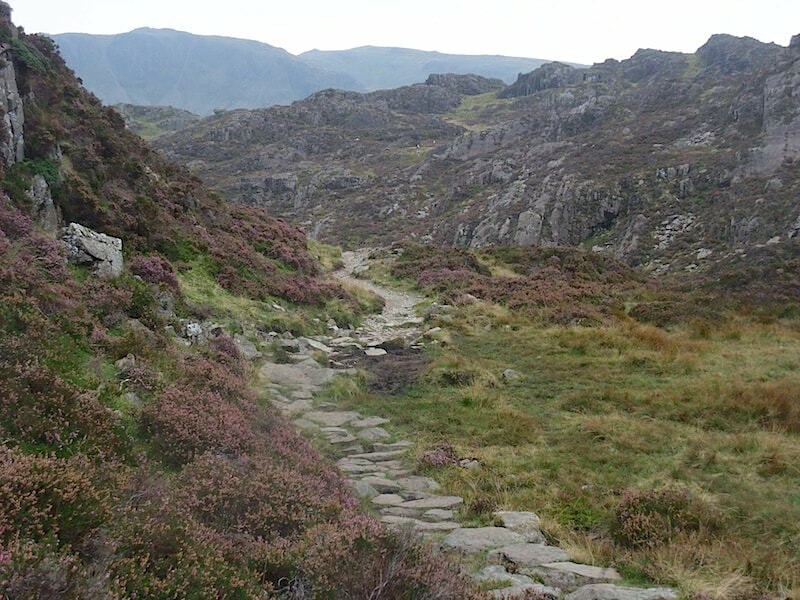 Hindscarth in the middle and then Robinson over on the left. 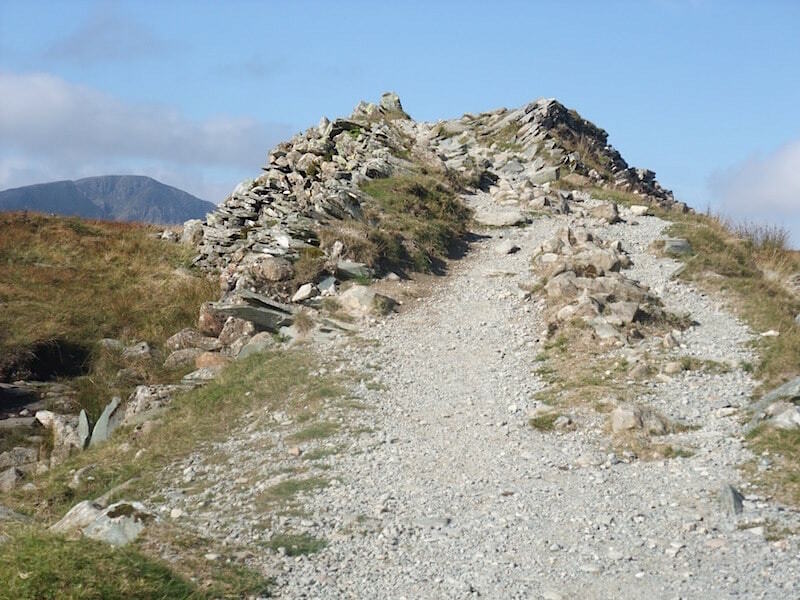 There is a path up the ridge to the top of Fleetwith Pike, as you’ve no doubt gathered its a bit on the steep side. Its very difficult to pick out any features or details on Pillar now. 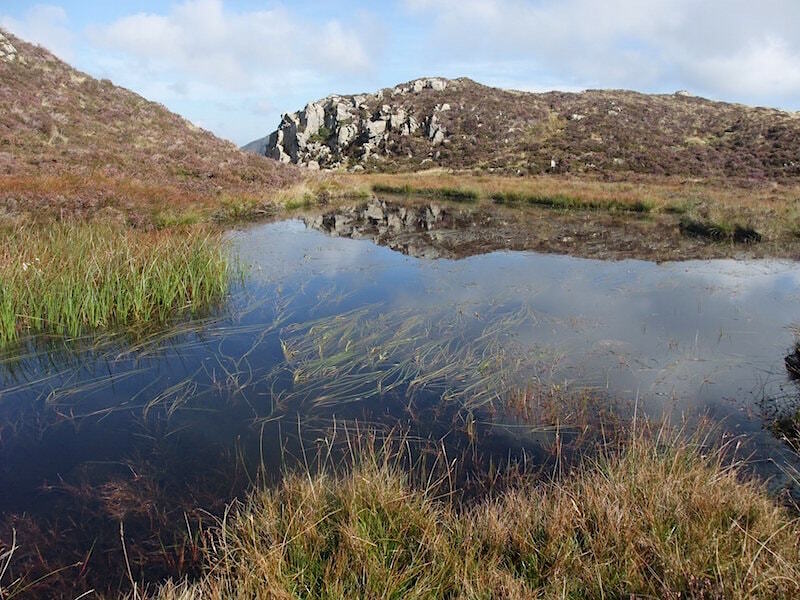 A view of the first cairn from the other side of the tarn with its rock reflections. 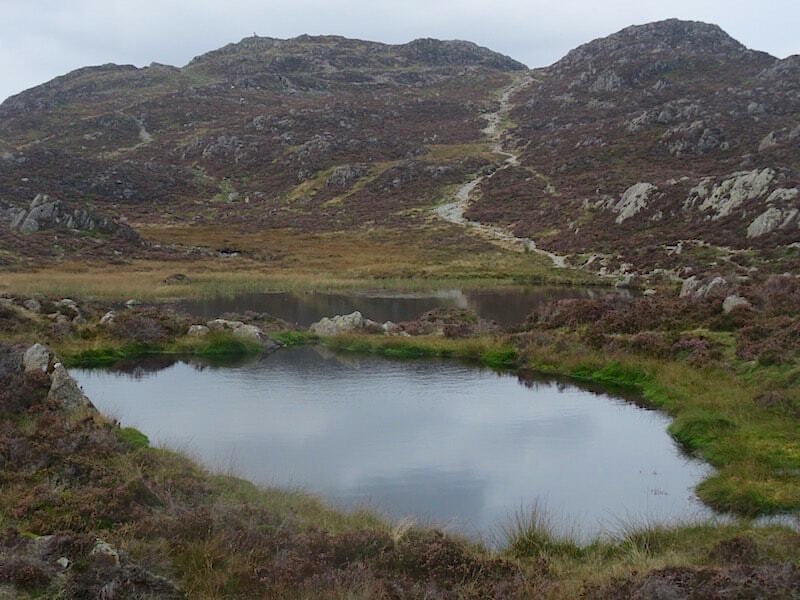 We decided to vary the return route slightly by using the path around the other side of Innominate Tarn. 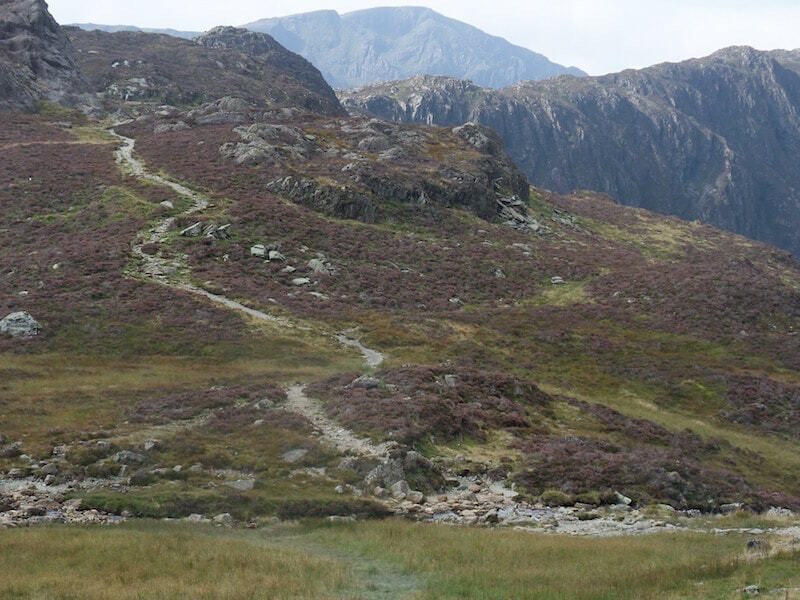 This is the view looking back at the path up to Haystacks from the opposite side of Innominate Tarn. 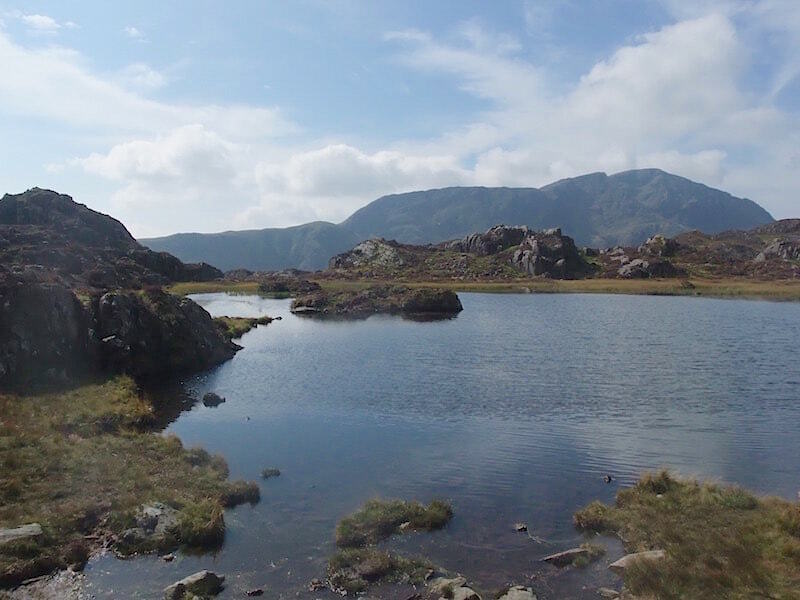 Another small un-named tarn just off to one side of Innominate Tarn. 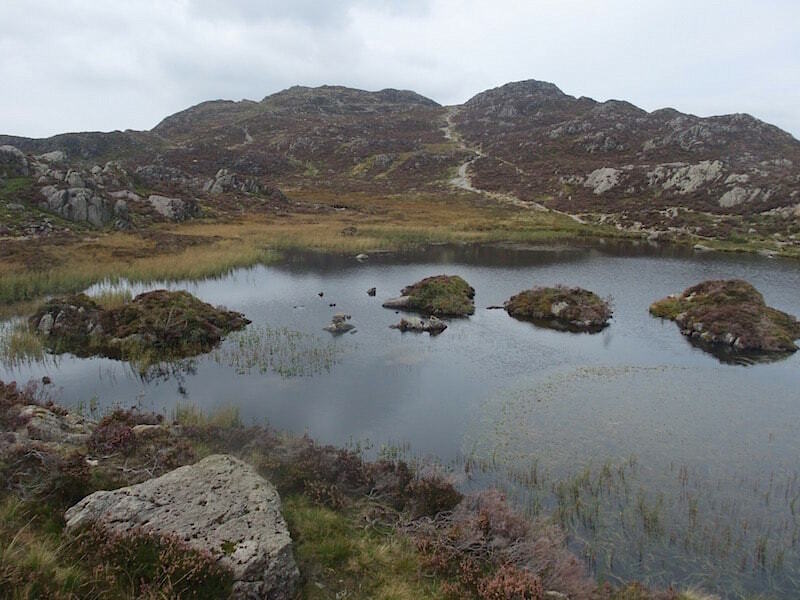 This is an area is full of small pools, tarns and boggy bits. 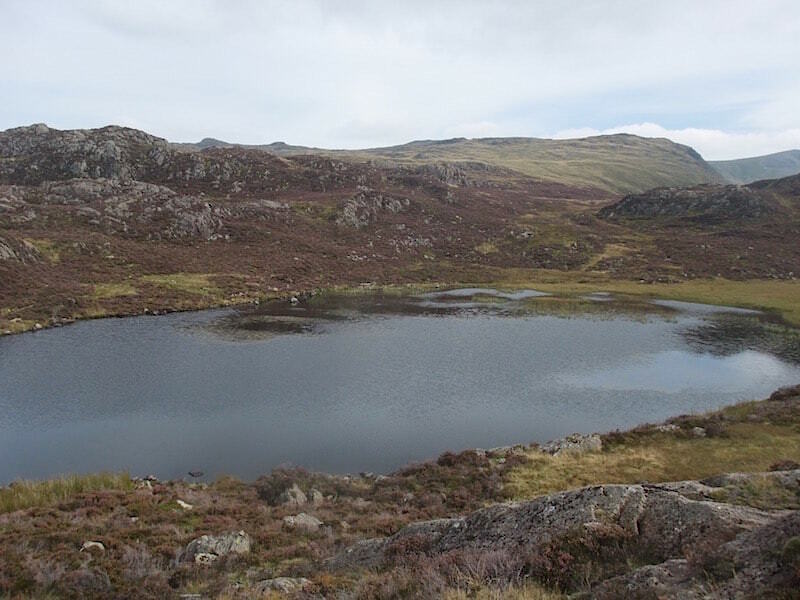 There is another un-named tarn alongside the first one. 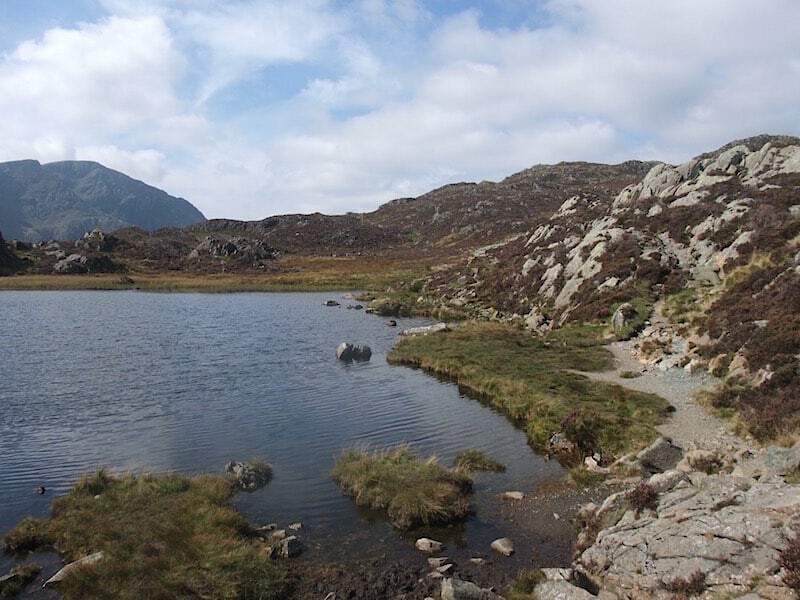 Looking back at an un-named tarn, with Innominate Tarn just behind it, and then the path up to Haystacks. 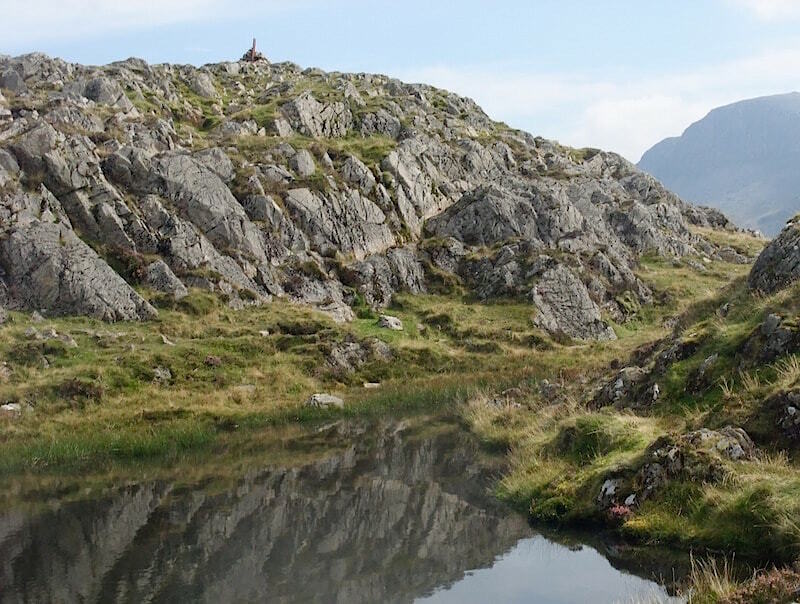 We went down to the tarn to look for AW’s ‘perched boulder’. 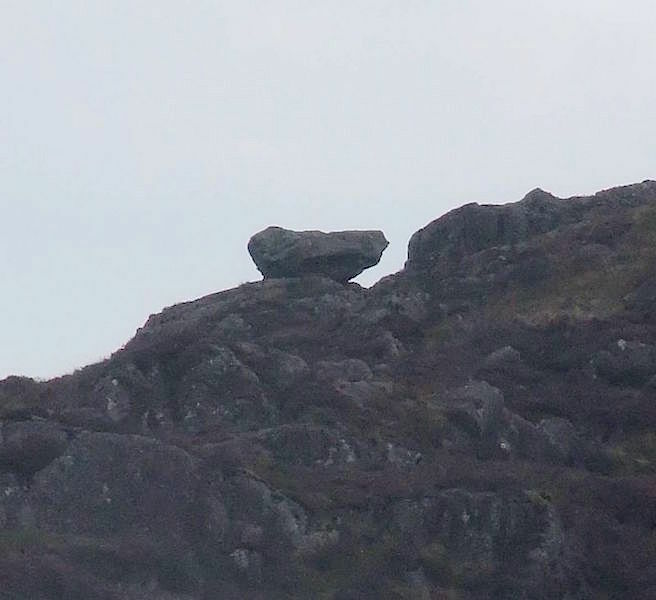 Although we knew roughly where to look this ‘perched boulder’ was taking some finding. Aha, so that’s where it is. Its not quite the view that AW has in his drawing but it will have to do for now. 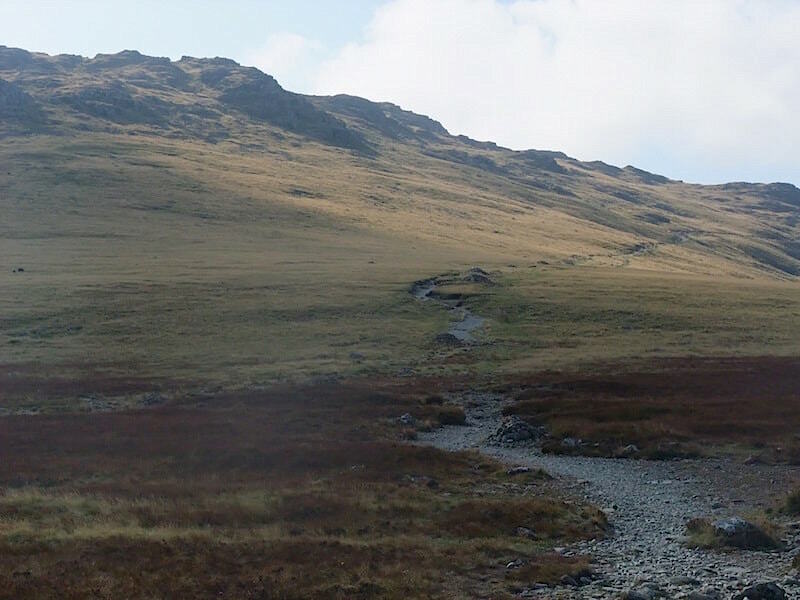 Looking back along the path we took from Blackbeck Tarn. Grey Knotts over on our right as we make our way over to Warnscale Beck. Crossing Warnscale Beck. Nerves of steel! 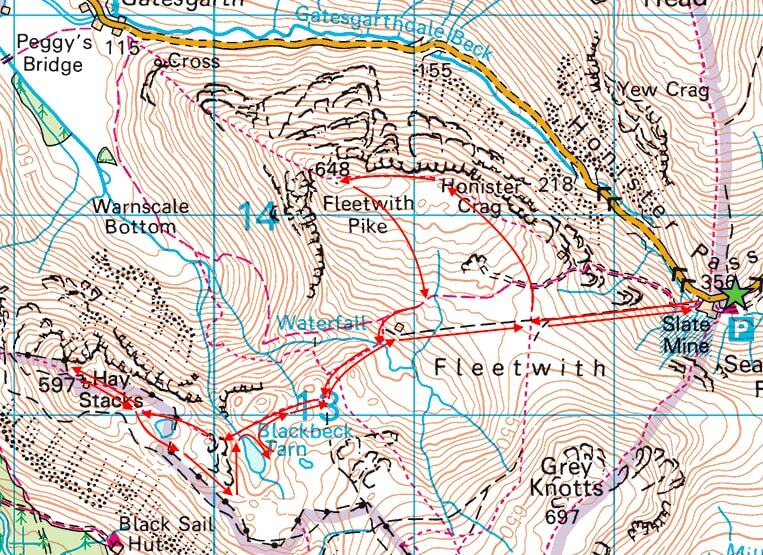 Grey Knotts again, showing the path which goes on towards Green Gable and Great Gable. 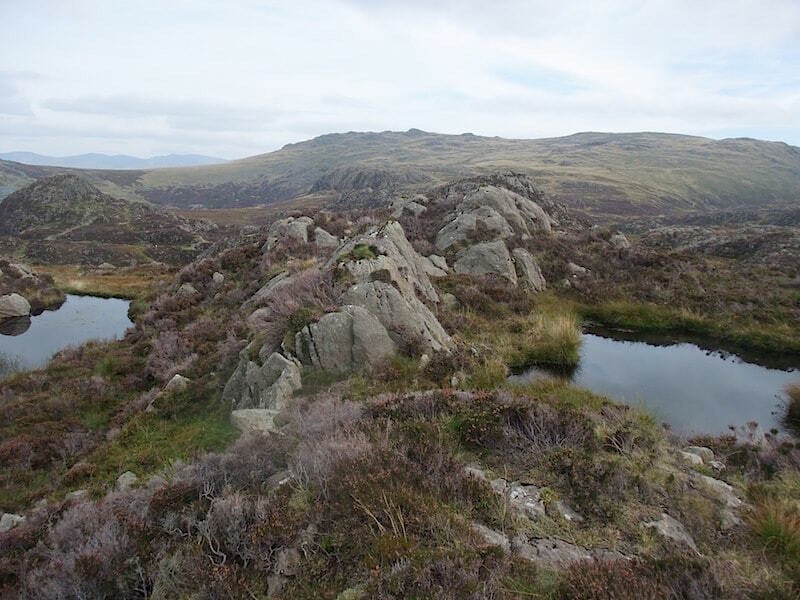 From the beck we pick up the old quarry road and in no time at all we are back at the old drum house again. Finally, a view through the rock cutting. 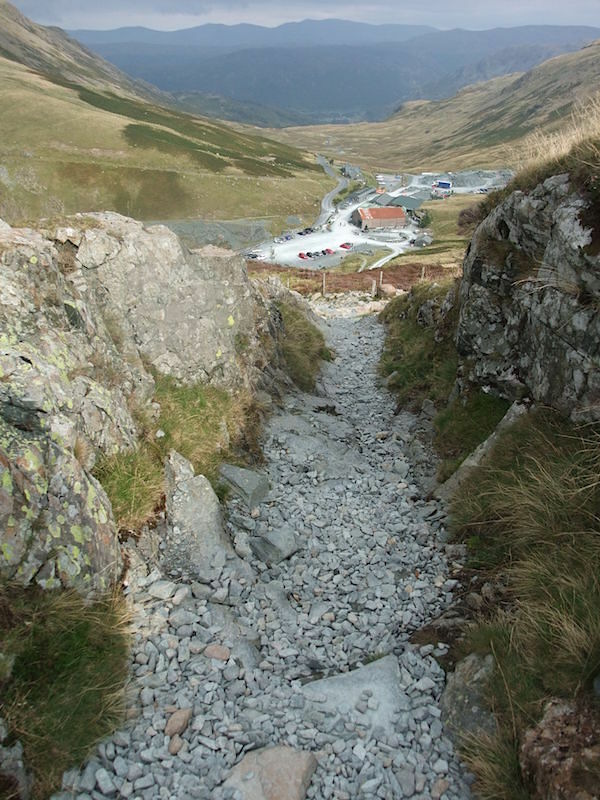 Our journey’s end, the slate mine’s workshops at Honister. A great little walk with some wonderful views on a lovely late summer’s day.